Mathe said in June, offers for properties encumbered by Virginia Outdoors Foundation (VOF) easements had been delivered and approval had been obtained from the VOF Board. However, Mathe said Dominion was unaware of internal steps VOF needed to complete in order to finalize those offers delaying them until late August. For the past few weeks, Dominion contractors have been constructing the foundations and erecting monopoles alone Route 15 in Orange as part of the Remington-Gordonsville transmission upgrade. This is part off the first phase of the project and includes a 4.5 mile stretch from Orange to near the Macmillan Publishing Services facility on Route 15. Pictured are the monopoles and lines that are replacing the older and more modest wooden frame construction. After years of planning and public meetings, construction has begun on Dominion’s Remington-Gordonsville transmission project. 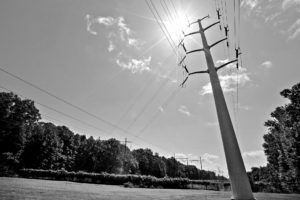 Approved and authorized by the State Corporation Commission in late August 2017, the project will upgrade the existing 115kV transmission line from Remington to Gordonsville to a 230kV line and switch the existing 53-foot wooden H-frame structures to 103-107-foot tall steel monopoles. The new monopoles require a 100-foot right-of-way, which was already existing in some portions and had to be obtained in others where the width was only 70 feet. In order to maintain reliability throughout the construction of the project, it was split into six phases, the first of which is expected to be completed at the end of November. The first phase includes two sections—one 0.3 mile length near Mitchells and a 4.5 mile stretch from Orange to near the Macmillan Publishing Services facility on Rt. 15. Poles are already up in Orange and Dominion Virginia Power Senior Communications Specialist Rob Richardson said workers begin pulling wire last week. However, the next phase may prove to be more difficult. The second phase is expected to begin this month and includes 11.2 miles from Orange to Mitchells. It’s expected to be complete by Dec. 1, 2019, and includes a potential section of a shorter H-frame structure. As part of the SCC’s approval, Dominion was granted the flexibility to utilize shorter structures where feasible along 24.1 miles of the approximately 38-mile stretch. That option was narrowed down to a 4.5-mile segment of the project located in the Rapidan area of Orange County along Clark Mountain. It was the only route that received enough votes along a continuous stretch via mailed postcards to meet a minimum 3-mile length requirement. In order to utilize the shorter structures, the right-of-way would need to be expanded to 140 feet and doing so has proved to be a complicated process. Originally, Dominion had a Sept. 1 deadline to conclude easement negotiations for the expanded right-of-way. However, according to Dominion Electric Transmission Communications Manager Greg Mathe, the process has taken longer than expected. A new deadline of Oct. 1 was issued. Mathe wrote that if the deadline wasn’t met, Dominion would move forward with the monopole option in its existing right-of-way. “This is the outcome we prefer to avoid, but it is a reality that cannot be overlooked as we must meet our regulatory obligations to provide reliable power in a timely maanner,” he wrote. It’s unknown if the October 1st deadline was met. Phase three, a fine mile segment from Remington to Brandy Station, is also supposed to start this fall and be completed by May 17, 2019. Phase four, five miles from Brandy Station to Mountain Run, would then begin in Spring 2019 and be finished by Dec. 1, 2019, followed by phase five, 6.6 miles from Mountain Run to Mitchells. Phase five also includes a 2-mile segment from Somerset to Gordonsville, with a start date of fall 2019 and completion of March 1, 2020, and a 0.8 mile reconductor construction near Louisa from fall 2019 to March 1, 2020. The project will end with phase six from near MPS to Somerset with construction expected to begin in the winter of 2019 and be completed by May 31, 2020. Property owners along each phase of the project will be invited to a construction information session prior to it beginning. Those alone phase one were invited to a meeting July 17 in the Town of Orange Public Works building. For more information about the project, visit https://www.dominionenergy.com/about-us/electric-projects/power-line-projects/remington-gordonsville-project. 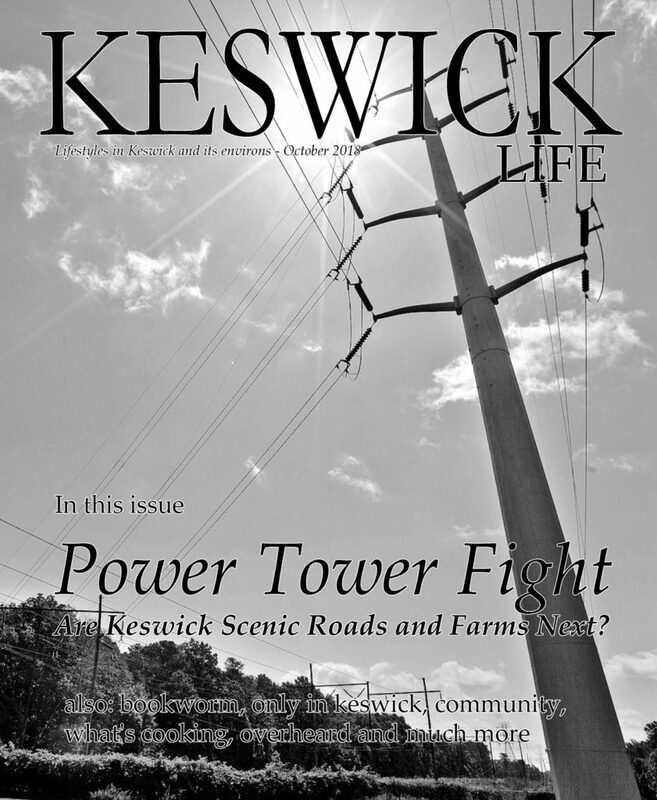 Editors Note: Keswick Life has learned a group of property owners and other concerned citizens have begun to gather to assess the threat to Keswick farms and lands. As news on what can be done unfolds, we will keep you posted. The group plans to lead the fight to protect Keswick environs but pressuring Dominion Energy to bury the lines as to preserve the beautiful countryside in this historic area. 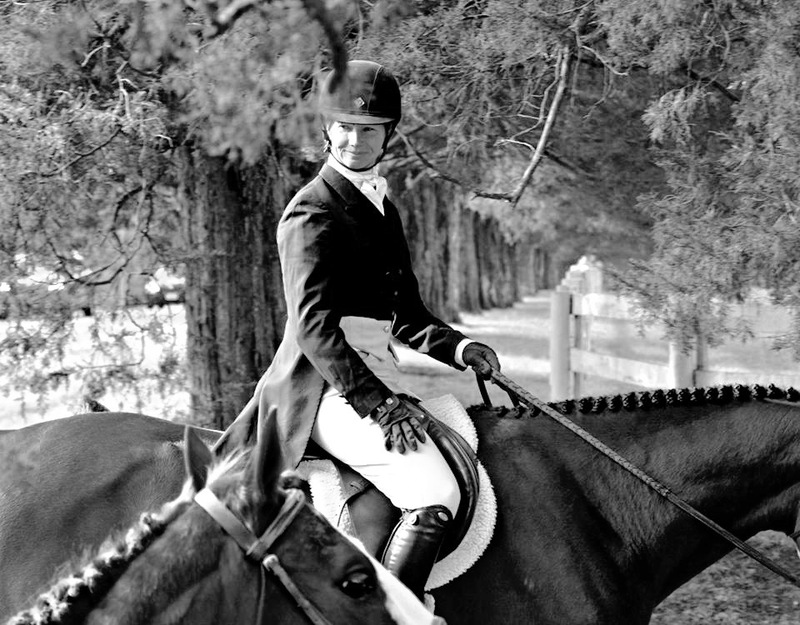 Paul Wilson Huntsman Keswick Hunt Club, with Sandy Rives. Hundreds gathered for the 90th Annual Blessing of the Hounds in Keswick early Thanksgiving morning. The tradition at Grace Episcopal Church dates back to 1929. 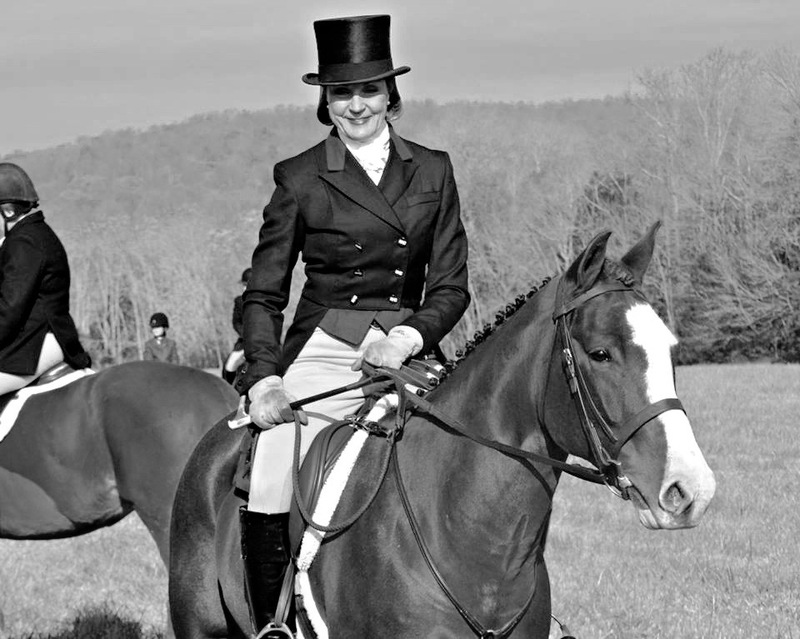 Many people say they can’t imagine their holiday without the riders attired in their formal hunting attire, the hounds, and the horses. The hunt began with a church service, then a collection for an animal service organization or local group. This year funds benefit the Wildlife Center of Virginia and the African American Teaching Fellows. 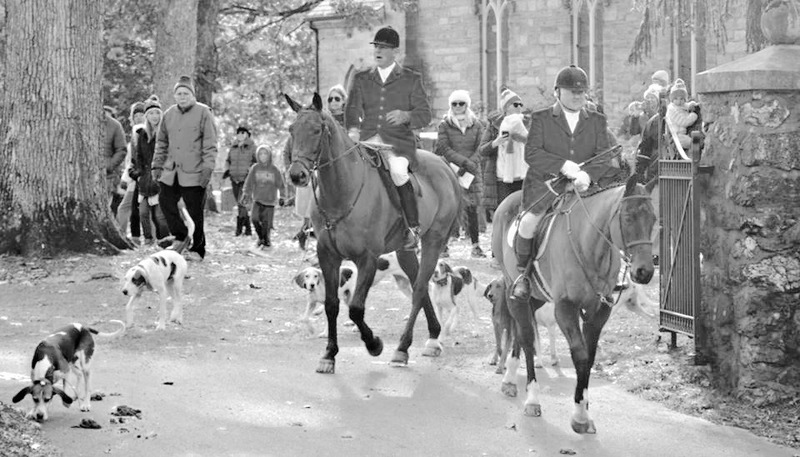 The riders then follow the hounds and huntsman leaving the churchyard and crossing rt. 231. After the pageantry each year — the blessing, the horn call, the huntsmen and hounds set off across the countryside. The hounds follow the fox. 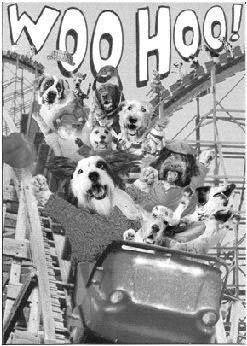 The riders follow the hounds. It’s a sport of horsemanship, requiring riders to cross streams and jump fences. But the fox usually outruns them all to the safety of its den. “Keep, oh Lord, this day bright, the horses sure of foot, the hounds swift, the fox elusive, the hunters safe. And may all come safely to their homes. Presented the story of Saint Hubert, the patron of hunters, who lived 1,300 years ago. 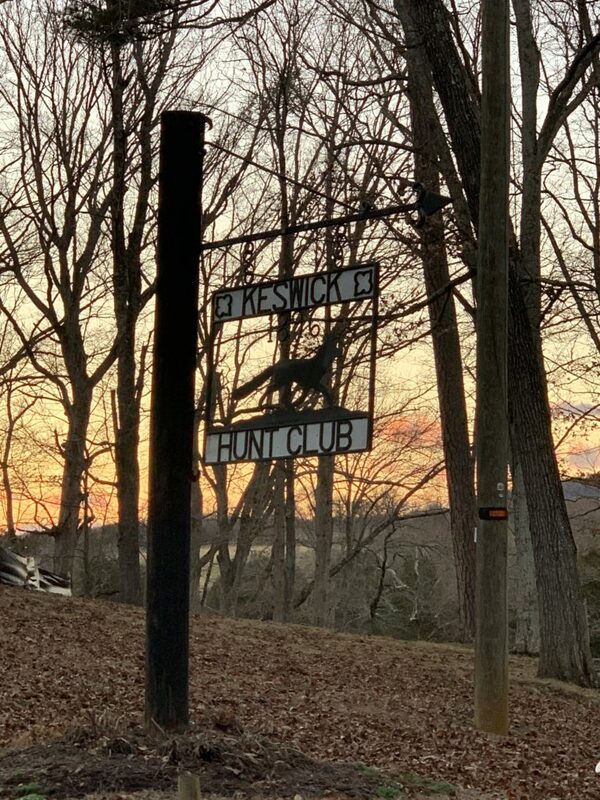 The owners of the resort commonly known as Keswick Hall and Golf Club, located at 701 Club Drive, in Albemarle County, Virginia (the “Property), requested several amendments to SP-2008-00042, which would allow for improvements to the Property, as more particularly described below. district, Clubs and Lodges; Swim Golf and Tennis Clubs; and Restaurants, Taverns and Inns are allowed pursuant to a Special Use Permit. Their application to the Board of Supervisors is an amendment to the uses approved for the Property, pursuant to SP 2000-33 and SP 2008-42, with the primary purpose of this request being a relocation and reduction in proposed uses and impacts. Use of the Property as an Inn originated from the approval of a Special Use Permit in 1978, identified as SP-1978-76, which allowed an Inn, as well as several accessory uses, such as swimming pools and tennis courts, both of which may be open to the public without regard to whether users are patrons of the dining facilities or guests at the Inn itself. The two most recent legislative approvals for Keswick Hall and Golf Club include Special Use Permits SP 2000-33 and SP 2008-42, both of which permit the expansion of the 48-room Inn and Golf Club use, 75 additional guest rooms and related amenities, as well as restaurants and spas that are open to the public. (b) Nonconforming uses, pro-vided the restaurant or inn is served by existing water and sewerage systems having ad-equate capacity for both the ex-isting and proposed uses and facilities without expansion of either system. allowance of Swim, Golf and Tennis Clubs via Special Use Permit in the Rural Areas, that both SP 2000-33 and SP 2008-42 were approved. No other property in the Rural Areas operates a Restaurant or Inn pursuant to Section 10.2.2.27(b), thus creating a unique scenario for the Keswick Hall and Golf Club Property. SP 2000-33 includes Conditions of Approval as well as a Conceptual Plan, dated 12-18-2000, prepared by Roudabush, Gale & Associates (the “2000 Conceptual Plan”). The 2000 Conceptual Plan is attached as Exhibit C. Although phasing is mentioned in the staff report, no phasing is 3 shown on the 2000 Conceptual Plan or specifically delineated within the approved conditions. 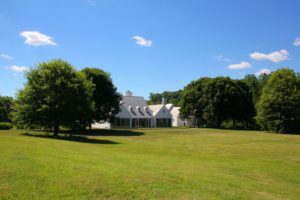 The 2000 Conceptual Plan shows an addition to the Inn, freestanding Cottages, a Banquet Hall, a Pool and Pool House, a Spa and several Administrative and Maintenance Buildings. The SP 2000-33 submittal package included a Traffic Study as well as information regarding the establishment and details of the Keswick Utility Company. This Special Use Permit allowed for the construction of 75 additional guest rooms in addition to the existing 48 rooms in the Inn, for a total of 123 permitted rooms. SP 2008-42 amended SP 2000-33 with updated conditions and an additional Conceptual Plan prepared by Train and Partners (the “2008 Conceptual Plan”) that is referenced within the conditions of approval. The 2008 Conceptual Plan is attached hereto as Exhibit D, and the approved conditions for SP 2008-42 are attached hereto as Exhibit E. The 2008 conditions of approval mimic those of SP 2000-33, although they also reference the 2008 Conceptual Plan, which generally shows the proposed Phase 1 improvements to the Property. The 2008 Conceptual Plan and conditions do not list any uses or breakdown of phasing, only buildings are shown. In SP 2008-42, which allowed for modifications to uses allowed within Phase 1, VDOT determined that by reducing the hotel room count of Phase 1 from 28 to 23, the traffic impact of the 13-room spa was mitigated, and the left turn lane on Route 22 was not needed for these Phase 1 improvements. 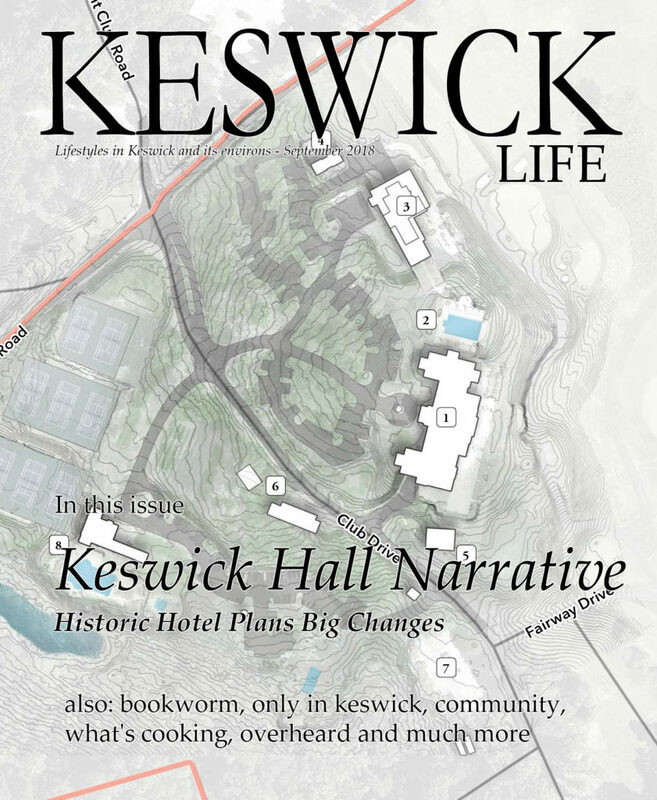 Except for any restaurant and spa on the property open to the general public, Keswick Hall and its associated facilities shall be used only by the guests of the inn and their invitees, and members of the Keswick Country Club and their invitees. It is important to note that neither the SP 2008-42 conditions of approval, nor the 2008 Conceptual Plan limits the size, number or location of any restaurant or spa on the Property. For a variety of reasons, including the economic recession that began in 2008, the previously designed and approved expansions of the Inn were not constructed. The Conceptual Plans approved with previous submissions were also overly specific, not allowing for the approved uses to shift in location within the site. The Applicant has engaged the architectural firm Hart Howerton and the engineering firm of Timmons Group to create a plan for the addition of a new wing of guest rooms, an expansion of the existing fitness facility to include a relocated restaurant, and a comprehensive renovation of the existing rooms and Inn. The proposed new wing and expansions have been designed to be sensitive to the scale and siting of the existing building. The wing is sited in the same location as the expansion approved with SP 2000-33 and as shown on the 2000 Conceptual Plan. However, because the proposed improvements are not in the exact same location or format as the SP 2008-42 approvals (including the 2008 Conceptual Plan), a new Special Use Permit amendment is required. We request approval of 38 additional guest rooms in Phase 1 for a total room count of 86 in Phase 1. As described earlier, the previously approved Special Use Permits for the expansion of the Inn allowed for a maximum of 123 rooms (48 existing plus 75 new rooms). Of these 123 permitted rooms, the 2008 SUP permitted Phase 1 to have 23 rooms, and for Phase 2 to have 52 rooms. This Application proposes that the maximum number of additional rooms permitted in Phase 1 be increased to 38 rooms, which would bring the total key count to 86 rooms. This request is a decrease of 37 rooms from SP 2008-42. This application includes the expansion of the Energy Plant building to meet capacity requirements for the new Guest Wing. This facility will increase in size by approximately 50% to incorporate the necessary additional mechanical equipment. It is anticipated that the footprint will expand on the west side, toward the driving range, in similar scale and appearance to the existing structure. The new Maintenance and Laundry Building sited near the Tennis Courts will relocate those same functions which are currently carried out in the existing Inn, and a separate maintenance structure, and are being displaced by the renovations and the new Guest Wing. Maintenance includes a workshop for repairs to the Inn, and the Laundry will handle guest linens currently processed in the basement of Keswick Hall. The facility will be an unobtrusive one-story building set in the landscape. 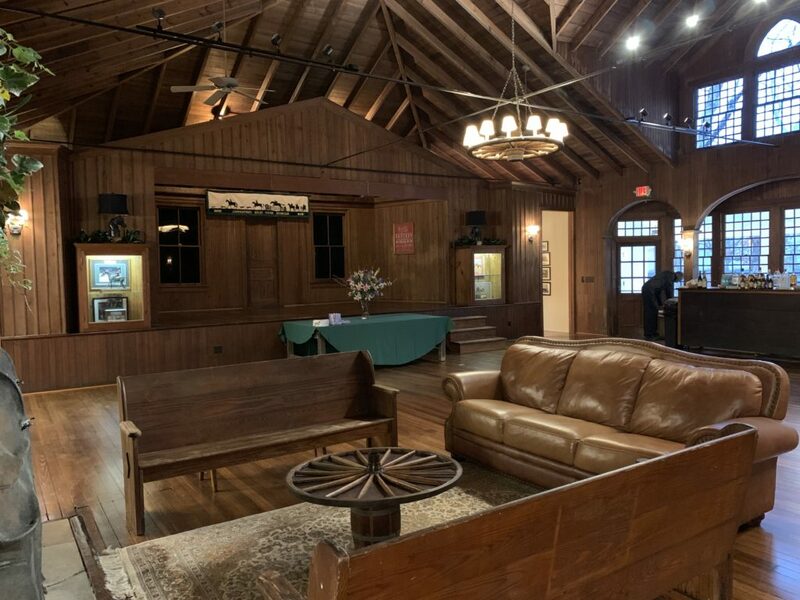 The new restaurant, located in an expansion of the Club House, will match the existing capacity at Fossett’s Restaurant, with a maximum of 165 seats. Although Keswick Hall is not listed as an individual resource on the State Historic Register, the Property is listed as a contributing resource to the Southwest Mountains Rural Historic District at the time the district was created in 1991. In SP 2000-33, staff discussed whether the renovations to the Property had impacted its contributing status. The Property was listed as contributing because of the Mediterranean style of the architecture and the fact that a portion of the building known as “Villa Crawford” was designed by Eugene Bradbury. No interior elements were considered. While Villa Crawford is part of the Southwest Mountains Rural Historic District, the Villa is not protected or specifically historic as it exists today. Of the 58,000 square feet in Keswick Hall, only 11,000 square feet (19%) are in the “original” Villa Crawford building, which is the wing adjacent to the horizon pool. During either the original addition, circa 1993, or prior to that, most of the original finishes had been replaced, and at least some the interior was modified to accommodate that addition. Additionally, the location of the new wing is proposed for the opposite side and newer portion of the structure, and is designed to be subordinate to the existing Inn as it steps down the hill. The proposed renovation and expansion seeks in every possible way to complement Keswick Hall, to honor the traditions of Virginia hospitality, and to celebrate the unique heritage of this hotel. 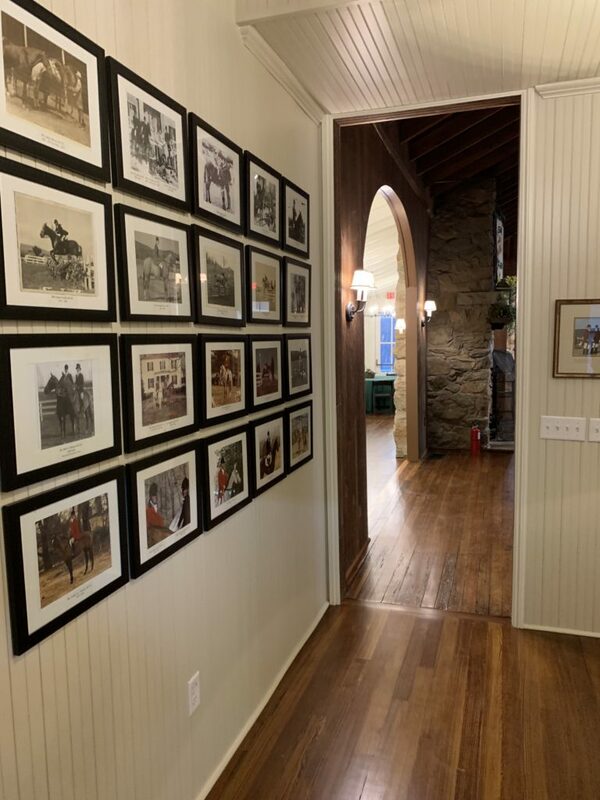 The architecture and character of the renovation is meant to highlight that history, while recognizing that the story of Keswick is defined by many incremental improvements and additions over time, adapting the Property to each generation of guests and members. This Application proposes to write the next chapter in that long legacy. The proposed renovation and addition will involve subtle modifications to the building envelope, exactingly executed in the spirit of Eugene Bradbury’s Mediterranean-influenced style, to allow for more a comfortable guest experiences. This will help to ensure the financial success of the hotel, which is critical to preserving and maintaining Keswick for future generations. The Applicants are committed to being respectful, long-term stewards of the Property, and will endeavor to ensure the integrity of this significant Albemarle County property. The Applicant proposes numerous improvements to the Property, as described below and as shown on Exhibit A, attached. Freestanding Spa with 8 Treatment Rooms (this is a reduction from the 13 treatment rooms previously approved per SP 2008-42). This is a net increase of 4 Treatment Rooms, as 4 exist in the current Fitness Facility. The Property is designated Rural Areas in the Comprehensive Plan, and is surrounded by the Golf Course, the Keswick Hunt Club and residential lots. Keswick Hall is a unique architectural and cultural asset within Albemarle County’s Rural Areas. The Property is recognized as a longstanding existing facility. The Property supports the regional economy through the employment of over 200 full and part-time employees. The Applicants estimate that the proposed expansion and renovation will result in an additional 148 employees, for a total of approximately 348 employees. Keswick Hall and Golf Course also provides significant contributions to the County tax base with over $600,000 paid in property, lodging and meals taxes annually. The total projected annual tax revenues for the project with the proposed expansion are over $1.5 million. 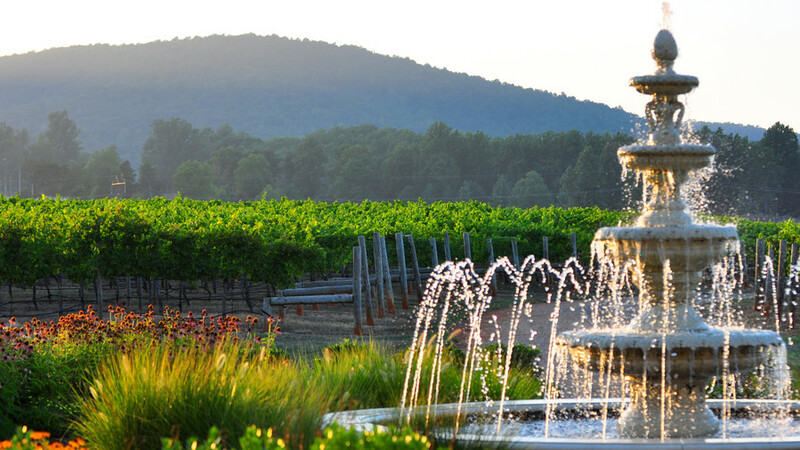 Property attracts tourists from all over the world and raised Albemarle County’s profile within the tourism community. 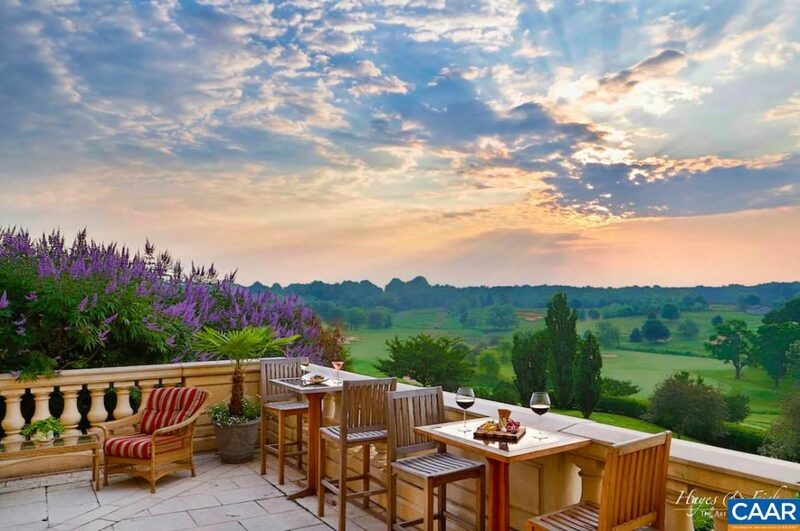 The Keswick Hall venue allows tourists, visitors and club members an immersive experience in the rural landscape of Albemarle County, thus fostering the protection and enjoyment of such areas consistent with the Comprehensive Plan. An updated Traffic Study by Timmons Group is included with this Application. The updated study is supported by the Traffic Studies and data that were provided in 2000 and 2008. The study concludes that the proposed expansion of the Inn will not result in any significant impact to the area roadways and intersections. Traffic data was collected in November, 2017 to analyze the existing volumes and capacity of nearby intersections. The study also analyzed whether the proposed expansion of the Inn would create any impacts to the roadway network. With the proposed 38 additional hotel rooms and a new spa (net increase of 4 treatment rooms), the updated traffic study confirms that all surrounding intersections would continue to operate at a Level of Service (LOS) C or better. In fact, the intersection of Club Drive and Black Cat Road continues to operate at a LOS A, even with the expansion. The north/south movement of Louisa Road is maintained at a LOS A and the Westbound approach from Hunt Club Drive continues to operate at a LOS C with minimal queuing. The traffic study confirms that no new turn lanes or tapers are warranted for the uses proposed with this Special Use Permit request. Timmons Group also studied the existing Water and Wastewater Treatment Facilities to confirm that the proposed expansion of the Inn would not exceed the capacity of the existing systems. With 86 total rooms, Keswick Inn remains under the threshold of the existing facility, with a maximum capacity of 76,000 gallons per day. 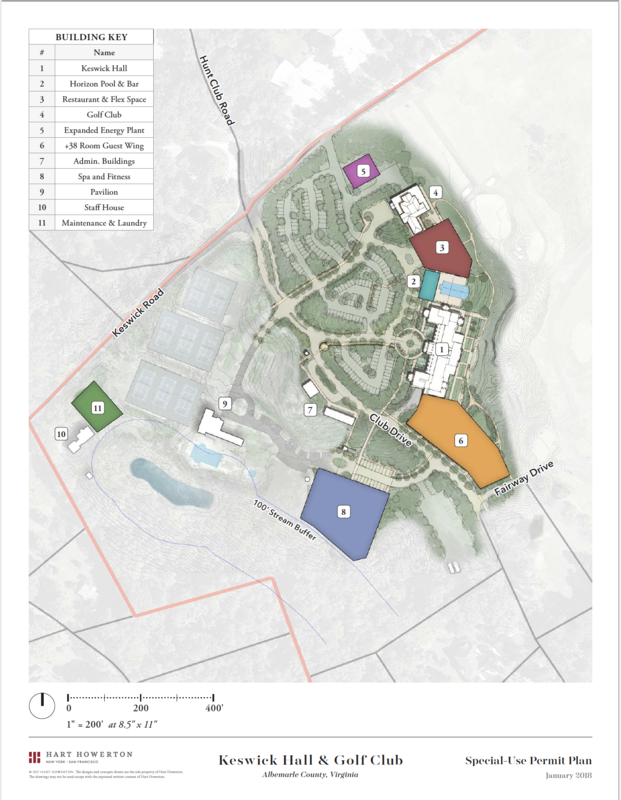 The Timmons Group analysis is attached as Exhibit G.
Because the proposed location of the new wing of guest rooms and new restaurant are within the immediate vicinity of the existing Inn and Clubhouse, impacts to environmental features are minimized. All new buildings, such as the Spa and Laundry/Maintenance Facilities are kept out of sensitive areas of the site including the stream buffer. The Special Use Permit Plan, showing the general location of proposed uses, includes a delineation of the stream buffer area. An Illustrative Plan and Conceptual Grading has also been included to provide supportive, nonbinding, documentation. By containing the proposed additions within a limited area of the site, the remainder of the land can be left as golf course area and open space to be enjoyed by the community. 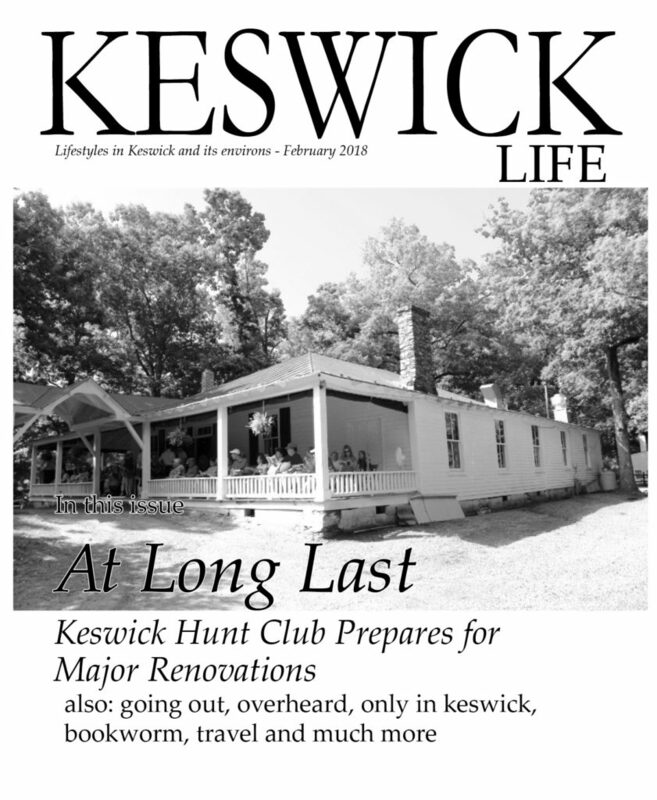 Editors Notes: We reached out for a reply from the general manger of Keswick Hall, John Trevenen, but we had nothing by our printing time. If we hear back, we will be sure to update you on this important story. 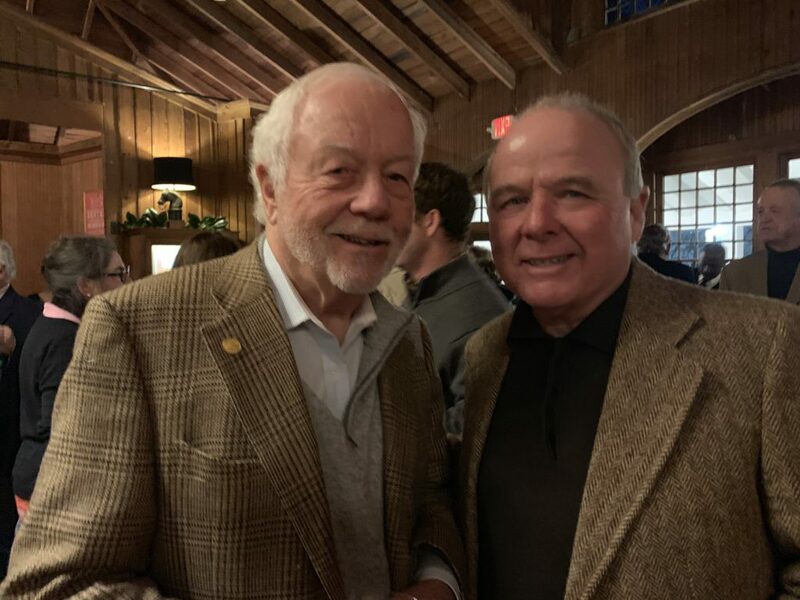 At a community meeting on May 13 at Chopping Bottom Farm, Peter Taylor and Tony Vanderwarker hosted Dan Holmes and Rex Linville of the Piedmont Environmental Council who outlined preliminary plans for a road going from Exit 129 on 64 up along the railroad right-of-way to Culpeper. A legislator from Danville submitted the bill and fortunately it was quickly voted down in the 2018 session. But he vows to bring it up again next year. While the PEC doesn’t think the road will ever be built since it doesn’t have wide support and the legislature and VDOT maintain the area has received enough spending for the work on 29, they see the interest in the bypass as a symptom of the problems on 22/231. In addition to the people downstate who are determined to get another route through Albemarle, Peter Taylor made the point that the increased traffic and fatalities on 22/231 have attracted the attention both of the Albemarle County Board of Supervisors and VDOT. At some point, Peter maintained, because of increasing traffic from Orange and surrounding counties down the road into Charlottesville, the BOS and VDOT will eventually be compelled to improve the road. “Improve” in VDOT’s parlance means to make the road faster, straighter and wider. While the conservation easements up and down the road most likely preclude four-laning the road, the state-maintained right-of-way on the shoulders could allow VDOT to widen and straighten the road, dramatically altering its character and possibly increasing traffic. The conclusion of the discussion was that the Keswick community needs to come up with plans to make 22/231 safer and enlist the support of our representative on the Commonwealth Transportation Board, the BOS and VDOT to preclude VDOT taking action on their own. The improvements on Route 50 running from D.C, west through Gilbert’s Corner, Middleburg, Aldie and Upperville serve as a example of potential opportunities we can take advantage of to make 22/231 safer. A traffic management approach called “traffic calming” uses physical design and other measures to slow traffic and make driving safer such as rumble strips, roundabouts and speed signs. Other ideas to reduce traffic on the road include ride-sharing, bus service and staggering work hours at UVa. Keswick residents funded a traffic study a while ago and we could adopt some of the ideas from that study to help make the road safer. Peter and I along with other community members will be working with the PEC to develop plans and make presentations to the CTB, BOS and VDOT. 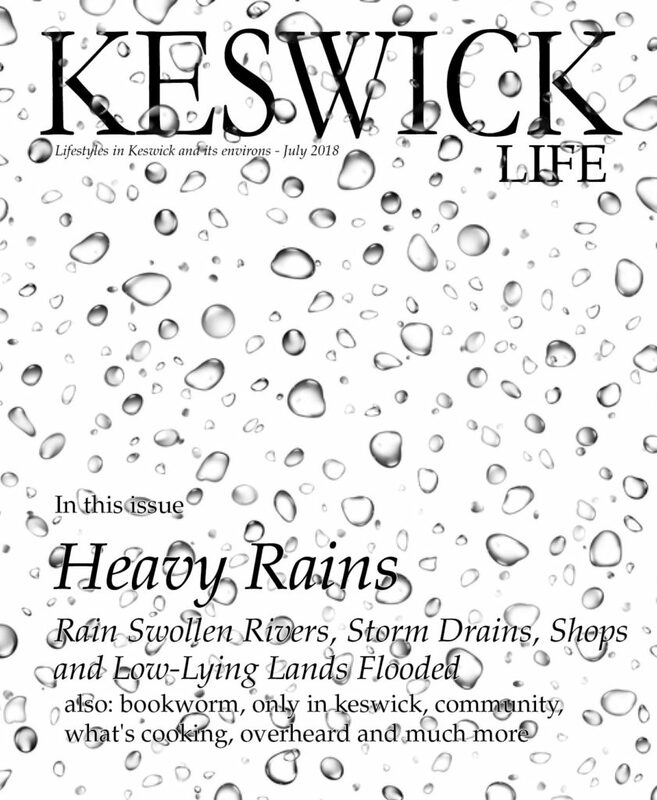 While we didn’t have the raging streams, swept away cars or deaths like they did in Ivy, we had our own little catastrophe in Keswick. 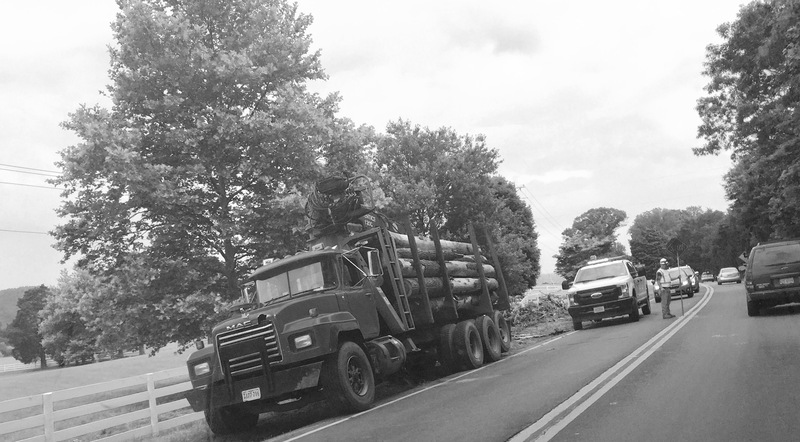 A tandem logging truck was coming up the S-turn in front of Horseshoe Hill when the driver (who was probably going too fast) over-corrected and went into the ditch just pass the Tall Oaks farm entrance. 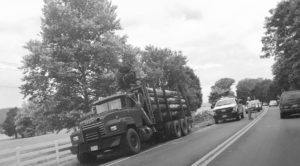 The load of large logs caused the tractor-trailer to tumble onto its right side taking out a dogwood and six sections of fence before it came to a stop. The logs spilled out over the downed fence and into the field. The driver suffered shoulder burns from the exhaust as he climbed out the driver’s side door but otherwise he was okay. VDOT and the police closed 231 from Black Cat to Cismont from 12:30 to 4 PM, funneling traffic onto Black Cat and back up 231 or 22 from Cismont. Only local traffic from houses north of the accident were allowed to go down the road. Although later in the afternoon, they did allow local traffic past Black Cat. By 4 PM, the road was back to normal, though the logs lying in the field, gashes in the right-of-way and busted fences were a sorry sight. We had the unique experience of walking up 231 on Friday afternoon with not a car in sight. Never having walked over the bridge over Choppjng Bottom Branch, we read a plaque that said: “Widened in 1978”. Forty years since VDOT has done major work on 231. Let’s hope we can prevent them from doing more work in the future (see accompanying article). By midday Saturday, the logs were gone and traffic was back to normal. As the renovation on the Hunt Club proceeds, there are a number of calls that have to be made on the fly—like what to do with the ancient rattan couch from the ladies’ room? A fixture for almost a century, its rattan is faded, its seat is rumpsprung with collapsed springs but since its been in the Hunt Club forever, should it be tossed into the dumpster or preserved? The crew doing the cleanout actually deliberated for a good fifteen minutes before heaving it over porch railing into the waiting dumpster. So what about the pot-bellied stove? With a new heating system, it won’t be needed but to many Hunt Clubbers, it’s a beloved relic that’s kept people warm (and often overcooked) for years. Some say it’s an outdated eyesore that has no business in the renovated club. Others are holding firm that it’s a treasured part of the club’s history. So far, it’s a keeper along with the stuffed foxes, tarnished trophies, wagon wheel chandeliers, naugahyde-garnished bar and Larry’s boot lamps. Okay, so the former storeroom and kitchen have been turned into additional space for dining and entertaining. Archways mirroring the arches on the opposite wall (over the windowed bay) have been cut in on each side of the fireplace to open the club to the new area. But what about the aged and weathered bead board walls? Though some of the board needs to be torn down, it will be replaced with identical bead board carefully stained to replicate the original. 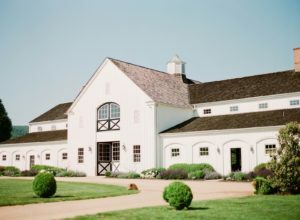 So far, everyone who has checked out the work agrees that the renovation retains the cherished character of the club while making it larger and more comfortable with HVAC, updated loos, a spanking new kitchen, handicapped accessible entrance, enlarged parking areas, and down-the-line when funded, much-needed rebuilds of the barn, kennel and huntsman’s cottage. Oh, and there’s a new wrinkle, off the porch to the right side of the club, a large terrace at the same level as the porch will be added. Remember how crowded the porch used to be at warm-weather events? Now we’ll be able to swarm out onto the terrace and even tent it for outside events. The board deserves a lot of credit for initiating the renovation and holding to its commitment to preserving the club’s character. Peter Taylor is hosting a hardhat walk-through on July 19 at 6 PM to take members through the progress of the renovation and answer questions. And hopefully accept donations from members to insure that all aspects of the project will be completed. Of course Keswick is stunningly beautiful, lush pastures bordered with three board white fences and divided by a twisty, roller coaster road running along the Southwest Mountains. Not only is it stunning but laden with history, Jefferson and Madison thrived here, Jefferson calling it “America’s Eden”. Hardly a day goes by without hearing someone say, “Did you hear what happened to BLANK? It’s all good-natured ribbing based on the shared understanding that we all make mistakes. Then there’s the Hunt Club with its run-down, ramshackle charm and raucous parties shared by all. Pictures of foxhunters hanging caddywampus on the walls, the curtains faded and frayed, the silver trophies tarnished, floorboards worn but no one would dare touch a thing. The interior is as sacred as the Gutenberg bible. A planned renovation was only approved when the members running the redo swore that they wouldn’t change the interior. 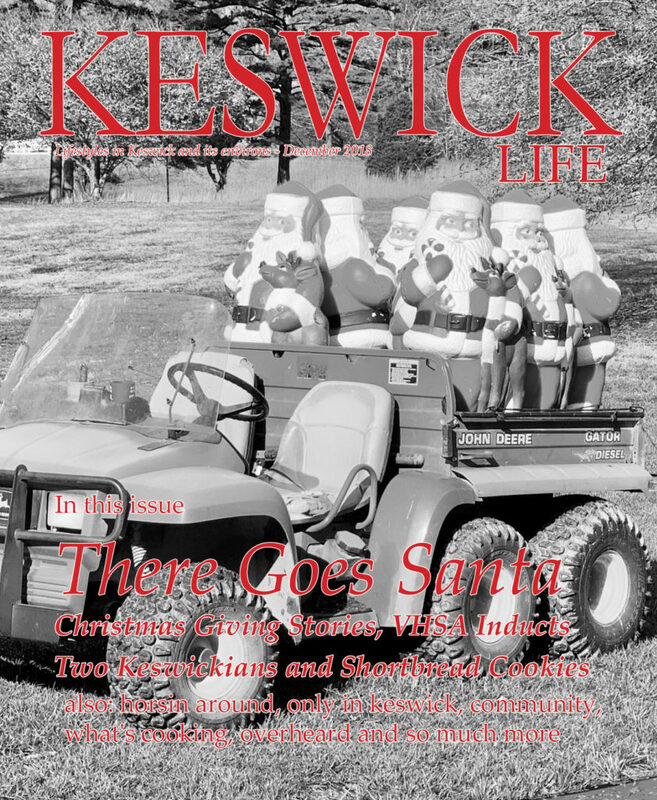 How about a tiny community with it’s own newspaper, just as funky as the Hunt Club with grainy pictures of people at community events, news of happenings in Keswick, a couple columns, a jumble of reflections on the unique nature of this place, all carefully and creatively crafted and edited by Colin with Winky as KL’s founder and editor. Talk about institutions—how about the Food Booth at the horse show? Manned by a good-natured grabass group of Keswickians who, despite their recognized incompetence at cooking and serving, manage to come up with some pretty good grub and have a great time doing it. Everyone coming away reeking of smoke and fryer oil. The horse show is an annual tradition opened with the Westminster Dog Show and capped off with Snookie’s Fish Fry. 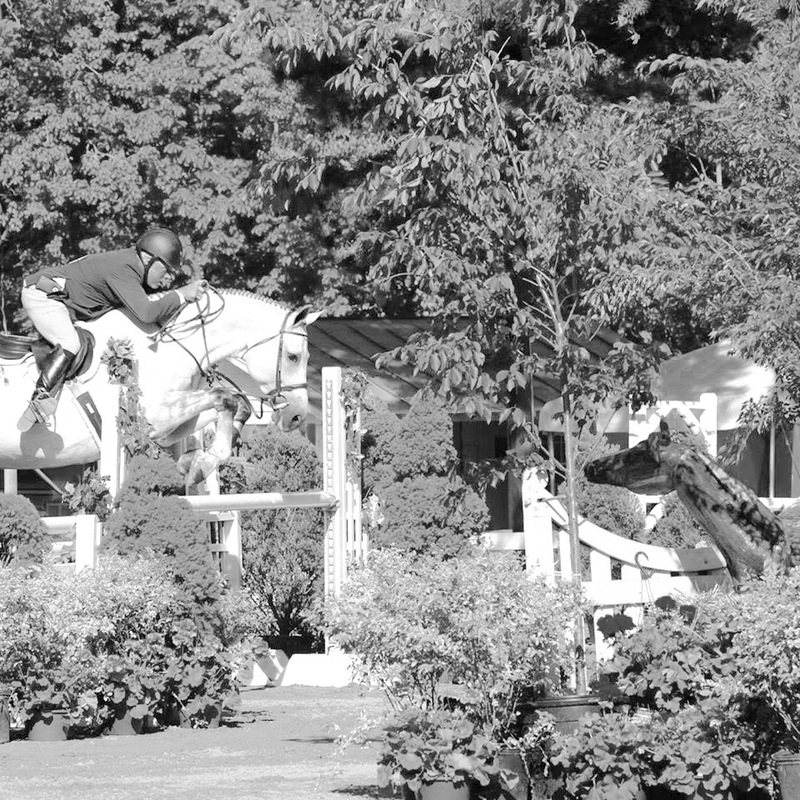 It’s a pageant of color and sound with expensive jumpers leaping over fences and spectators taking in the show. Hilltoppings are Keswick’s version of a tailgate where you circulate down the line of picnic tables knoshing on delectables people have brought, drinking their wine and chitchatting, it’s a giant picnic in a sprawling field filled with good friends, the exuberance at being together on a beautiful evening so heady you can cut it with a knife. And in the middle of all this studied funkiness is a tony resort. Keswick Hall, or as locals call it, “The Hall”. It’s a grand old mansion dating from 1912 that’s been updated to high swanky. It’s as inapropos to Keswick as a log cabin would be to Fifth Avenue. 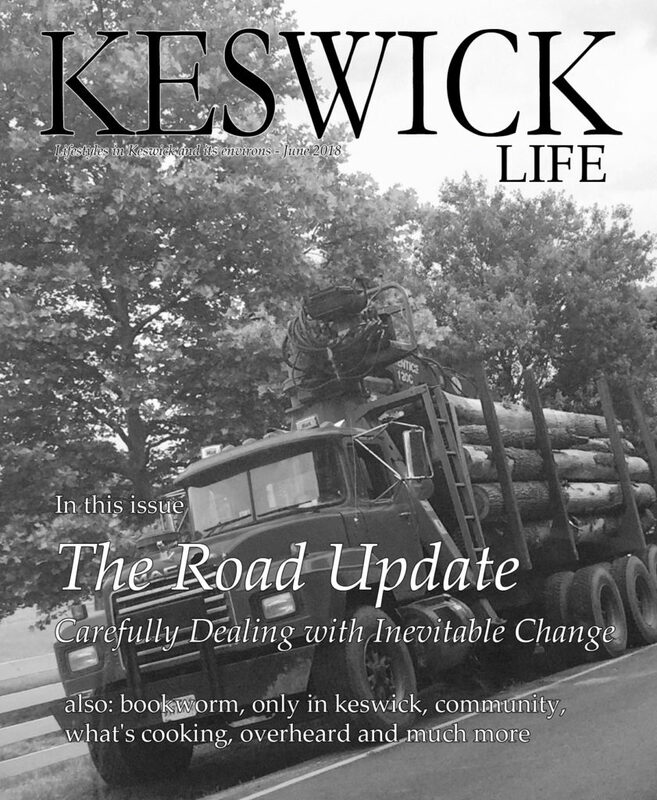 But because Keswick includes all sorts of incongruities, pickup trucks and beaters, Ferraris and Maseratis, rickety shacks and multi-million dollar mansions, The Hall somehow finds its place in Keswick. A couple of adventurous entrepreneurs are starting to turn Keswick from horse country to wine country. One has even jokingly referred to Keswick as “Keswick Valley” as in “Napa Valley”. Vineyards are beginning to swarm over the landscape and more are planned. It’s a gradual but striking change in the character of Keswick and while initially disturbing, people are beginning to take the transition in stride, realizing that farmland can be enhanced with endless rows of grapevines. Besides, who doesn’t like a nice glass of wine? The Keswick post office is like an ongoing reunion where you meet and greet friends you haven’t seen in a while. “Hey, how are you? How’s it going?” people say as they get out of their cars to go in and get their mail. It’s Keswick’s version of Main Street, people’s paths crisscrossing so they can get an update on their friends’ experiences and catch up on the latest gossip. 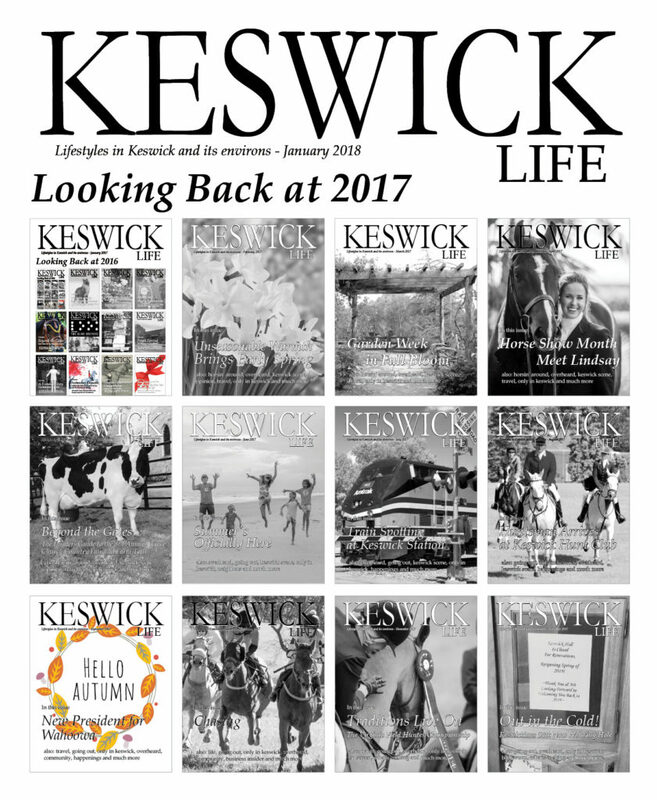 People here are endlessly kind and generous, helping out the less fortunate, always openly greeting each other, sharing jokes and stories, with wealth, achievements and reputation set aside because everyone shares a common experience—we all live in Keswick. It’s a remarkably unique area. Rich in depth and character, unique with its special personality and unlike any other place in the world. Some don’t take to it and longtime residents will say about a new arrival, “They won’t last,” and usually they’re right. It’s not for everybody, just for those of us who wouldn’t live anywhere else. Spring is slowly, very slowly, coming around in many parts of the Keswick environs and even though it felt a little more like winter recently, a sure sign that warmer weather is ahead came with the Historic Garden Week Tour through the bucolic Keswick Hunt Country and the upcoming Keswick Horse Show.. 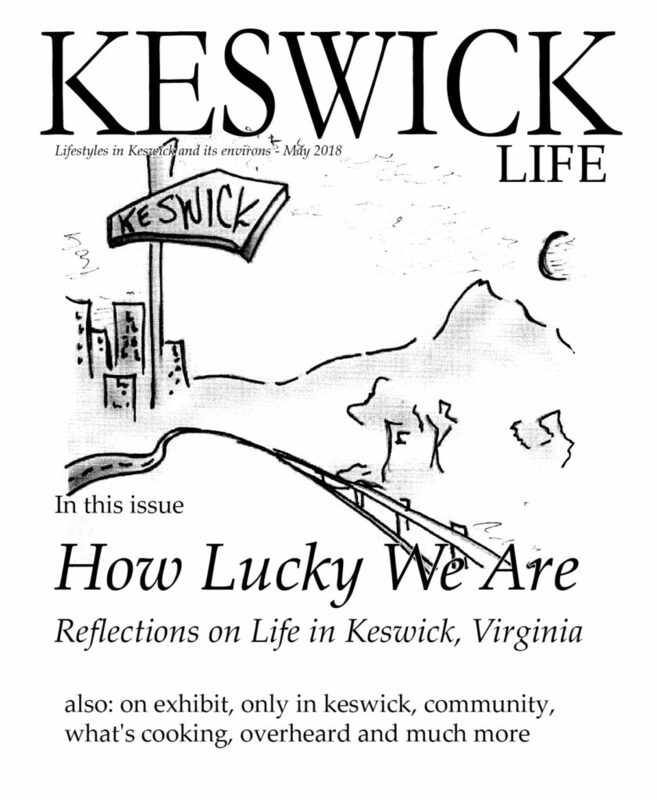 The Keswick environs – the place to be in the Spring – love it, love the history of it while driving down rt. 231 enjoying the view ! The 114th Annual Keswick Horse Show presented by The Lindsay Maxwell Charitable Fund will again be held at the historic Keswick showgrounds from Tuesday, May 15 through Sunday, May 20.The Keswick Horse Show, the second oldest horse show in the United States, started and continues to be a community horse show that represents the best of Virginia horseman and our community. 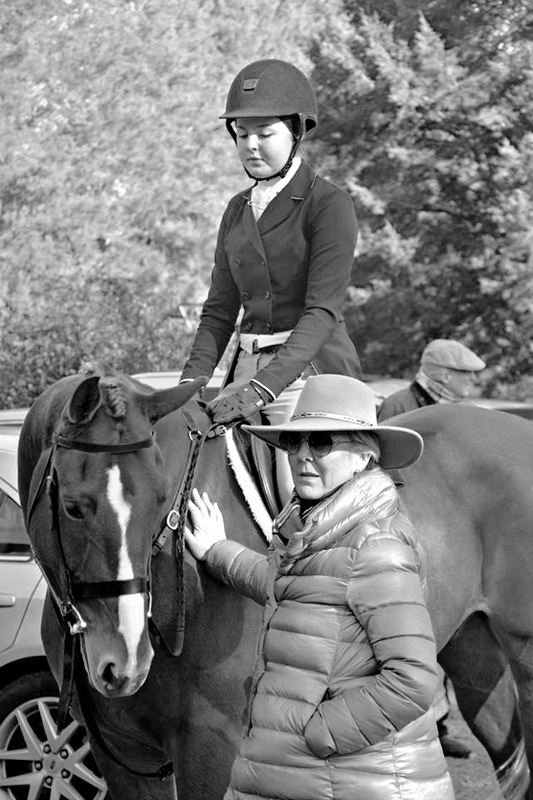 Started in 1904, the horse show has been chaired by members of the Keswick community and Keswick Hunt Club. Thanks to organizations like The Lindsay Maxwell Charitable Fund charity horse shows can continue to grow, thrive, and help the charities that they serve. It’s people like Lindsay whose mission is to dedicate themselves to the sport by providing opportunities and memories to children that make this world better. 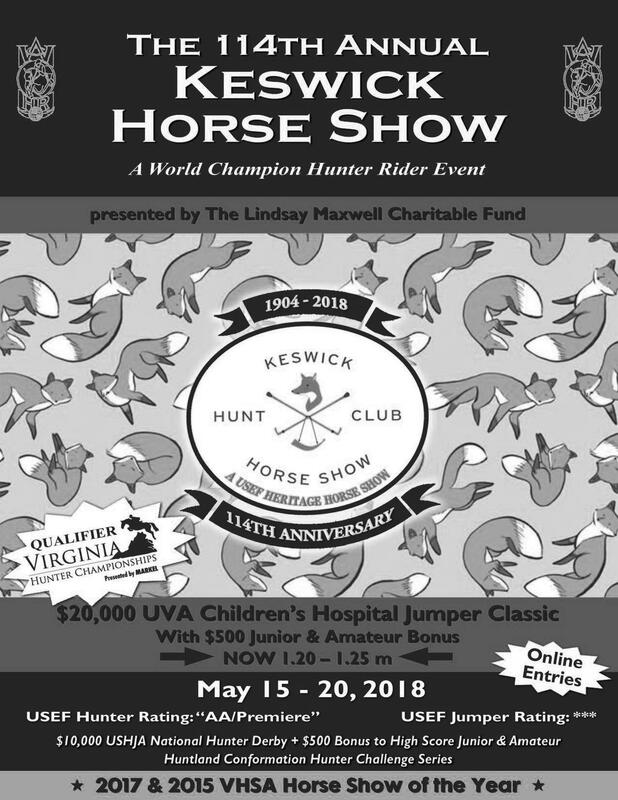 This year’s show is brought to you by the Keswick Hunter Jumper Foundation to benefit UVa Children’s Hospital. 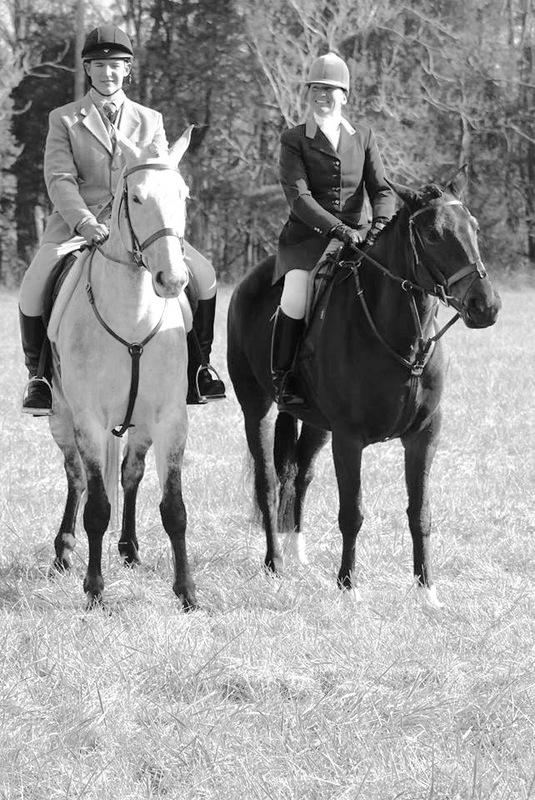 Keswick has maintained its excellence as a AA rated World Champion Hunter Rider Event and has been designated a USEF Heritage Competition. 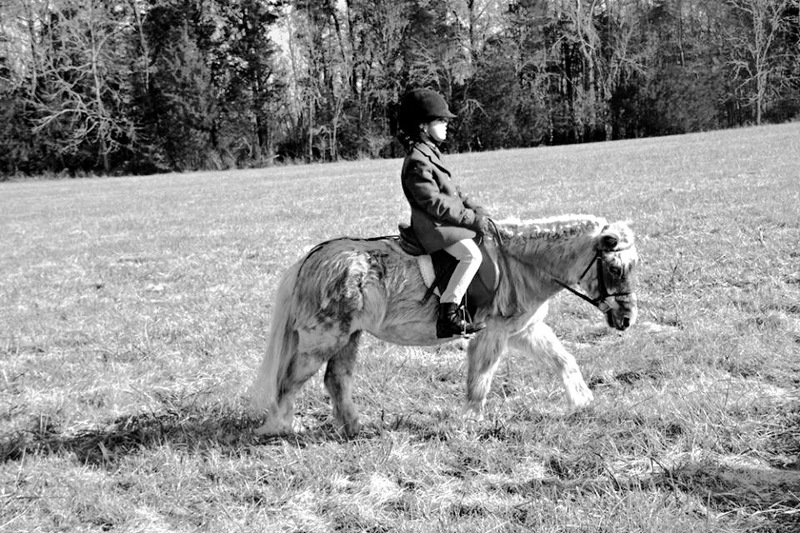 The Keswick Horse Show has helped different charities including Habitat for Humanity, Charlottesville Senior Center, The Boys and Girls Club, SPCA and UVA Children’s Hospital. 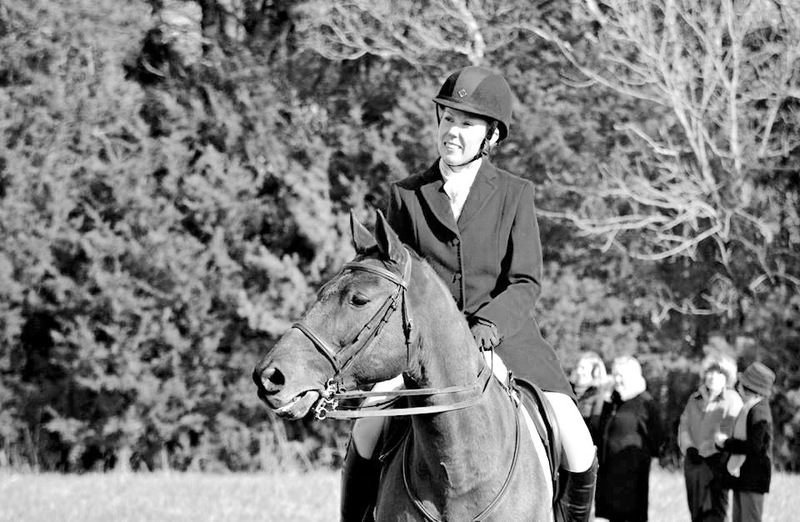 Over the past 20 years, the horse show has raised close to $500,000 for its different charities and has attracted some of the most famous horses, trophies, exhibitors and trainers to walk the showgrounds.The Keswick Horse Show has become such an integral component of our community. 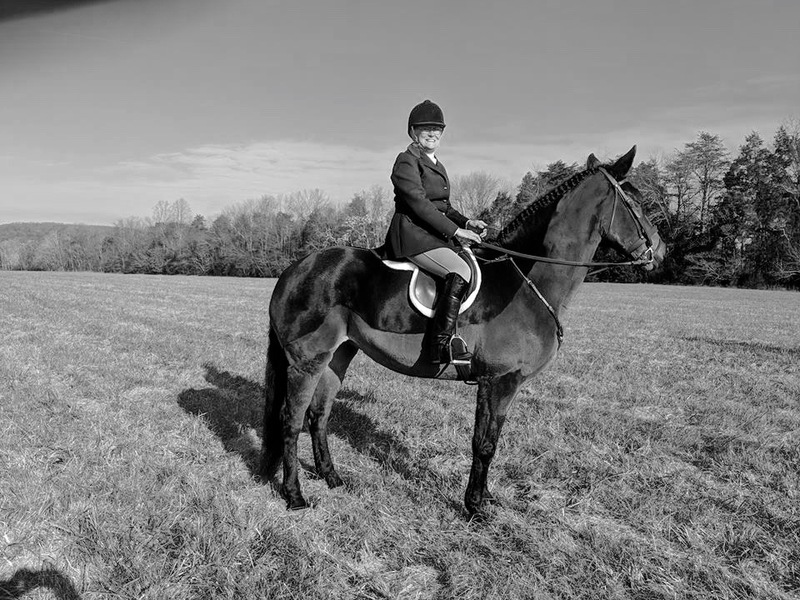 It’s a must attend event for both community members and top-level equestrians. The entertainment committee has created a wonderful schedule of events, including the Eastminster Dog Show and Exhibitor party under the tent on Wednesday night. 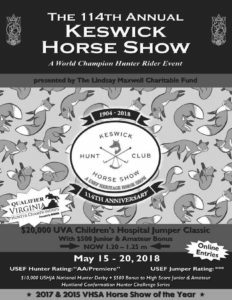 On Thursday, May 17th, the Keswick Horse Show will host Karats & Cocktails in support of the show’s beneficiary, Friends of UVA Children’s Hospital. The ticketed Karats & Cocktails event will feature jeweler Meira T Designs, live music, cocktails, and an exclusive bourbon tasting. 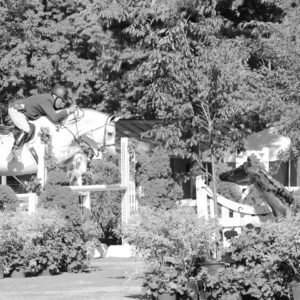 The weekend starts with the USHJA National Hunter Derby followed by dinner and dancing Friday night. Saturday is always a special gathering for the entire community as the Jumper Classic is a beautiful evening that has become a tradition in Keswick. Sunday’s Down Home Fish Fry on the porch will be a relaxing conclusion to a wonderful week. 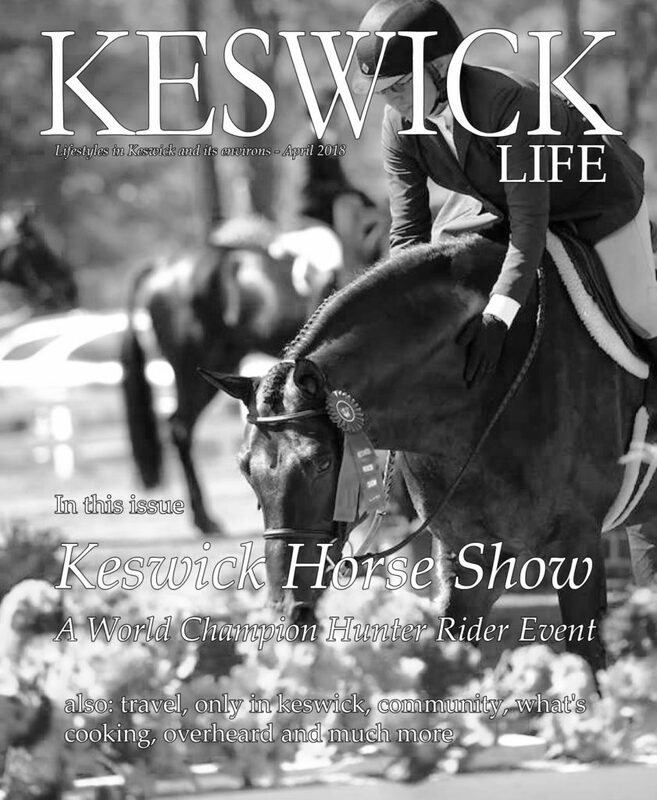 For more information, including the hospitality event schedule, available sponsorships, and contact information, please go to the Keswick Horse Show website. Its almost time again – the 34th Eastminster Dog Show! This years show is Wednesday, May 16, th. Registration: 5:30 p.m. Classes begin at 6:30 p.m. Rain or Shine. As always, it is at Keswick Hunt Club Horse Show’s Upper Ring after the Horse Show finishes for the evening. 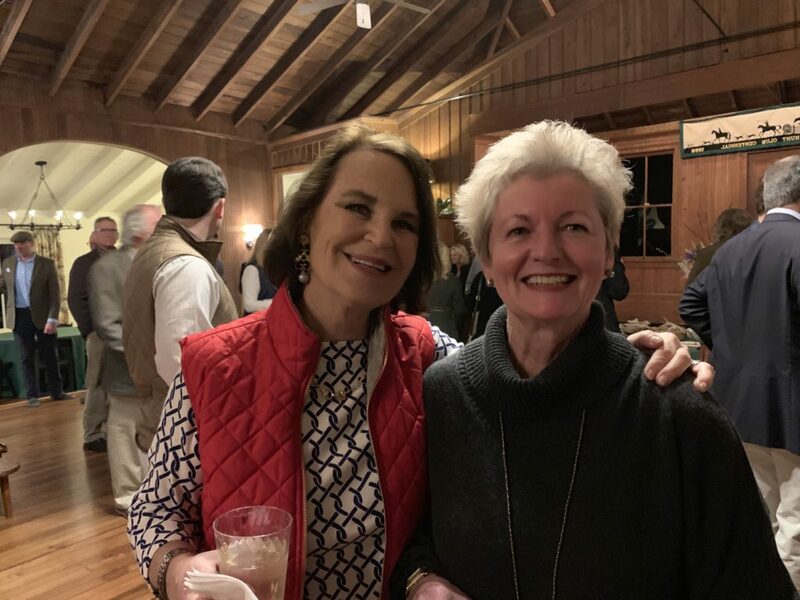 This years Celebrity Judges: Our own beloved Jennifer Nesbit and Angie Gunter, Executive Director of the Charlottesville/Albemarle SPCA. Remember, it is FREE to participate. All dogs must be on leash and spayed/neutered, but, otherwise nearly anything goes! Following are the classes: The Family Class invites both dog and human family members. Musical Chairs is always convivial chaos. The Agility Class offers a simple obstacle course appropriate for kids and dogs of all ages and abilities. The Costume Class encourages creativity and humor. The Best Rescue Class shows off the most amazing adopted dogs and finally, The Best in Show is chosen from the winning line-up of all classes. Donations to the Charlottesville/Albemarle SPCA are encouraged and appreciated. 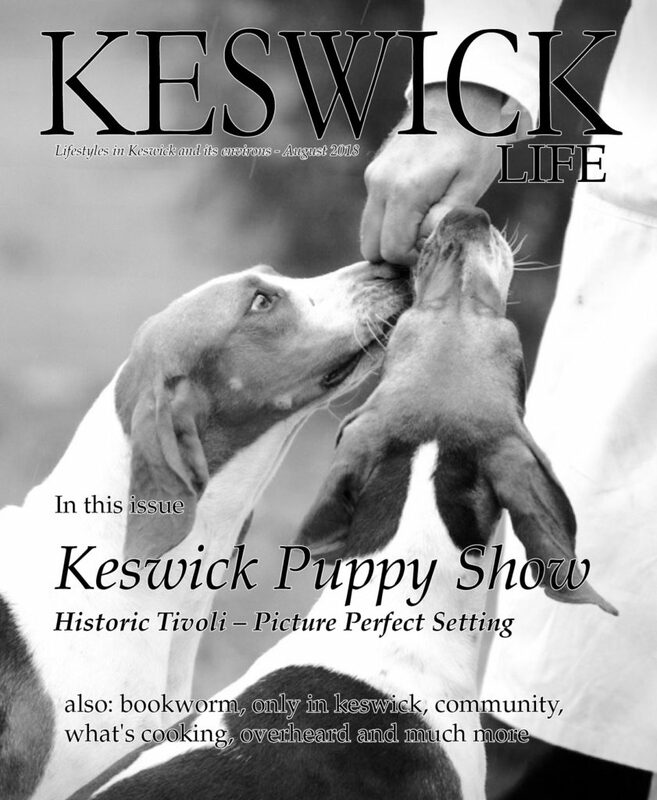 Eastminster is sponsored by The Animal Connection and Keswick Life. 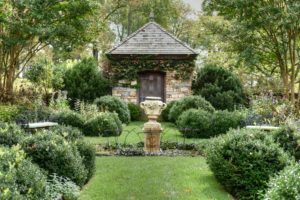 The beginning of Historic Garden Week dates to 1927, when a flower show organized by the Garden Club of Virginia raised an impressive $7,000 to save trees planted by Thomas Jefferson on the lawn at Monticello. The Garden Club of Virginia operates as a non-profit organization comprised of 47 member clubs and 3,400 volunteers. Proceeds from Historic Garden Week fund the restoration and preservation of Virginia’s historic public gardens, provide graduate level research fellowships and a Garden Club of Virginia Centennial project with Virginia State Parks. Since the first statewide tour, over $17 million has been contributed to these worthwhile causes. 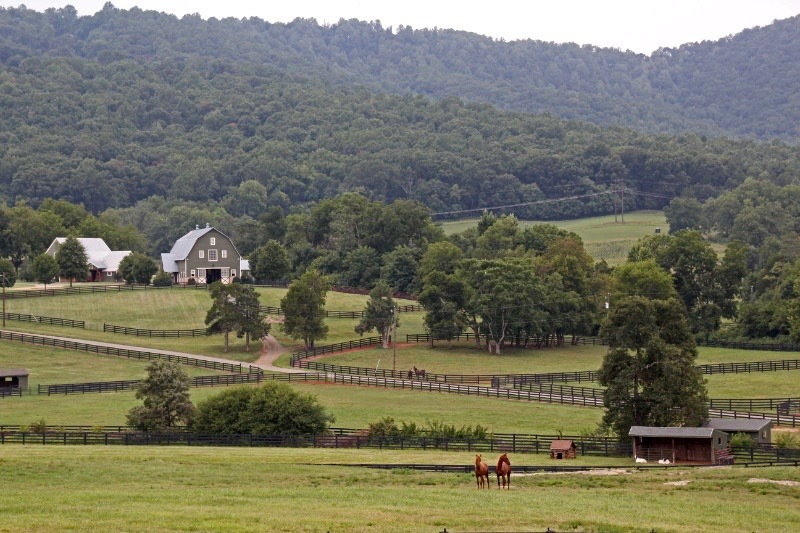 This year’s tour takes us to the bucolic Keswick hunt country of Albemarle County. 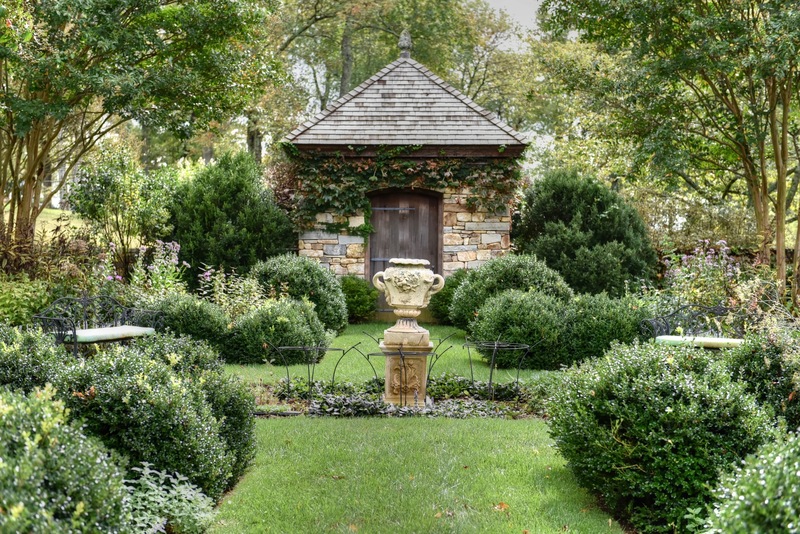 On Sunday, April 22nd the House and Garden Tour visit properties, including a 1,250-acre estate on the Virginia Landmark Register; an 18th century home with formal gardens and an extensive arboretum-never before on tour; a contemporary, award-winning farmhouse; and historic Grace Episcopal Church. Visitors will travel historic roads amid scenic vistas through part of picturesque Keswick Hunt country, situated in the Southwest Mountains Rural Historic District, listed on the National Register of Historic Places in 1992 in recognition of its historical significance to the early settlement of Albemarle County. The district contains a broad range of 18th and 19th century architecture as well as 20th century estates, all evocative of grand, classically inspired manor homes reflective of its earlier history. Visitors will have access to five of Albemarle County’s finest private, historic properties, dating back to the Jefferson era. Enjoy estate architecture and stunning gardens that have come to typify Mr. Jefferson’s Central Virginia. (Garden Only) Accessible through East Belmont only. Scottish for “breezy hill,” Ben-Coolyn is a gracious estate set on a rise with commanding mountain views across rolling, well-kept pastures. Large oaks surround the 1870s main house, built on the site of the original late 18th century home of James Clark. The 145-acre farm is part of what was originally known as Clark’s Tract, which dates back to the 18,000 acre Meriwether Land Grant of 1730. There is a c. 1850 chestnut log corn crib, which is one of the largest and best-built in the county. A picturesque balloon-framed bank barn is built on an older rock barn foundation. Other dependencies include a guest cottage by the pool and a glass greenhouse. 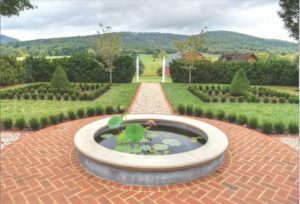 The previous owners, Ann and Peter Taylor, spent several decades restoring and developing the park-like grounds and gardens. They created an arboretum in the old front hayfield, with hundreds of high and low canopy trees, and planted many native trees, including 176 willow oaks along the driveways, as well as a vast array of deciduous flowering magnolia cultivars and crosses. Restorations included a nearly 100-yearold boxwood hedge that lines one side of the main drive. Of particular note are the elegant parterre garden rooms surrounding the home, featuring tulips, roses, peonies, flowering trees, water features and many spots to pause and enjoy the views. Peter took the lead in designing the gardens, including an arbor inspired by one he saw in Nantucket. Ben-Coolyn is protected for future generations with a conservation easement held by the Virginia Outdoor Foundation. The Tree Stewards organization will be leading tree walks throughout the day. Katie and Christopher Henry, owners. (Accessible via shuttle from tour headquarters only) Through an arched folly flanked by an ancient boxwood hedge, visitors get a first long view of this grand, two-part historic home dating back to 1764. The original clapboard Georgian dwelling was built by Dr. Thomas Walker, a colonial leader and explorer of the west. The stately Federal brick portion was erected in 1823 for William Cabell Rives, minister to France, a U.S. senator and Confederate congressman. Rives’ granddaughter, noted novelist and playwright Amelie Rives, and her husband, Russian painter Prince Pierre Troubetzkoy, made their home at Castle Hill in the early decades of the 20th century. In addition to its storied history, the property is noted for its extensive gardens and landscaped grounds. 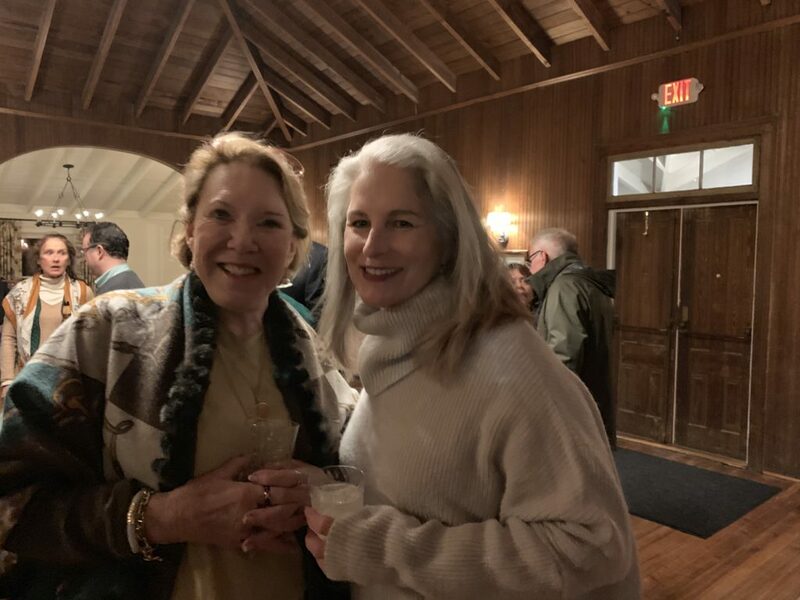 Stewart and Ray Humiston, the previous owners of the 1,600 acre farm (what remained of Walker’s original 15,000 acre tract), placed the estate and 600 acres in conservation easement through The Nature Conservancy. 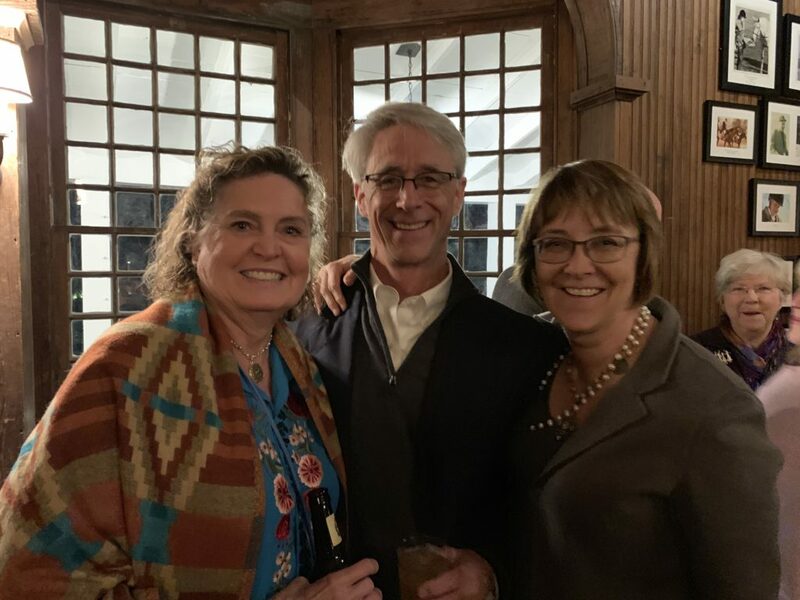 They donated an additional 400 acres to The Nature Conservancy to create Walnut Mountain Preserve, and they sold the remaining 600 acres (also placed in conservation easement), which has since become Castle Hill Cider. They spent a decade restoring the home and grounds to its former grandeur. The beautiful home, formal gardens, historic dependencies, a 14-stall horse barn, small cottages, guest cabin and extensive fenced pastures are a testament to their efforts. Their commitment to historic preservation is one that the new owners are eager to continue. On the National Register of Historic Places and the Virginia Landmarks Register. The Tree Stewards organization will be leading tree walks throughout the day. Ann and Peter Taylor, owners..
Keswick Designated Metropolitan Home’s “House of the Year” in 2002 and inspired by Hugh Newell Jacobsen, a prominent Washington architect, the owners designed their house to reflect the Keswick architectural vernacular. It consists of multiple modules in a stylized farmhouse character that mimics farm outbuildings. Along with Charlottesville architect Jeff Dreyfus, they carried the minimalist look inside with contemporary Italian and French furnishings and an all white décor that showcases their American folk art and photography collection. From the all glass front of the house, there is a stunning view of a 70-foot lap pool with the Southwest Mountains as a backdrop. The house has surrounding gardens planted with cutting flowers for Mrs. Vanderwarker’s flower arranging business, Fearless Flowers, as well as a newly expanded shade garden down by the all-weather stream running alongside the property that gives the farm its name. The landscaping is minimal; maples line the drive, Chinese elms bracket the pool, and crabapples flank the house, with cedars transplanted from the property surrounding the courtyard. 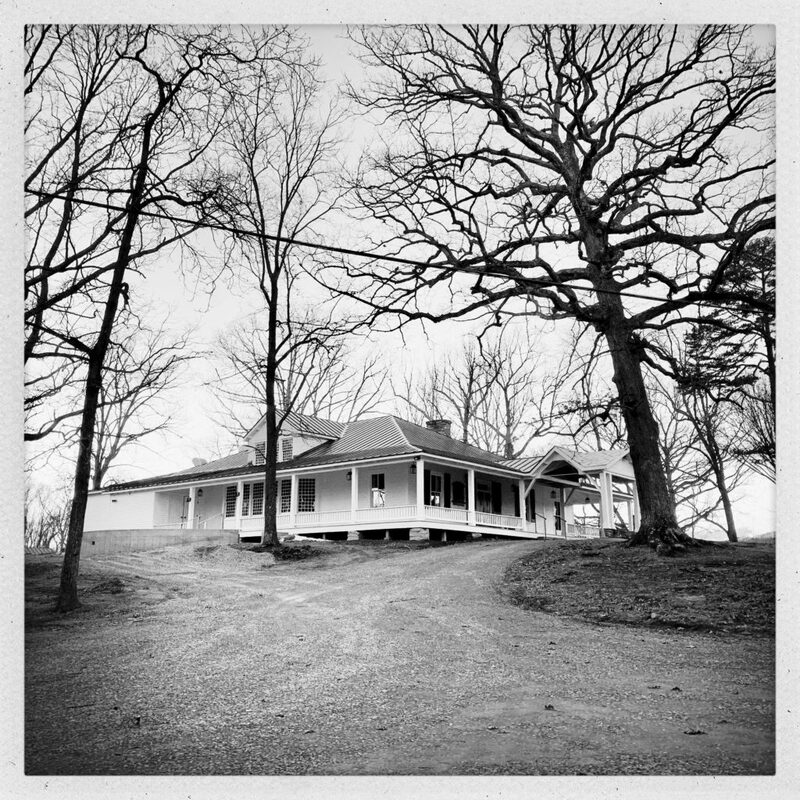 Mr. Vanderwarker’s writing studio, a 9 ft. x 20 ft. high structure, sits on a knoll overlooking the property. House, grounds and the studio will be open. Chopping Bottom is protected for future generations with a conservation easement held by the Virginia Outdoors Foundation. Annie and Tony Vanderwarker, owners. Enter through the stone columns of East Belmont and you are welcomed with a stunning panorama of lush, rolling fields and mountains in the distance. The main house rests on a knoll about a mile from the highway with views of the countryside in every direction. The main house, dating back to the early 1800s, is surrounded by old Kentucky coffee trees and mature boxwood. A gated formal garden and a colorful cutting garden can be viewed from the new pool house and patio. An orchard of Chinese chestnut trees provides shade for the riding ring during hot summer months. 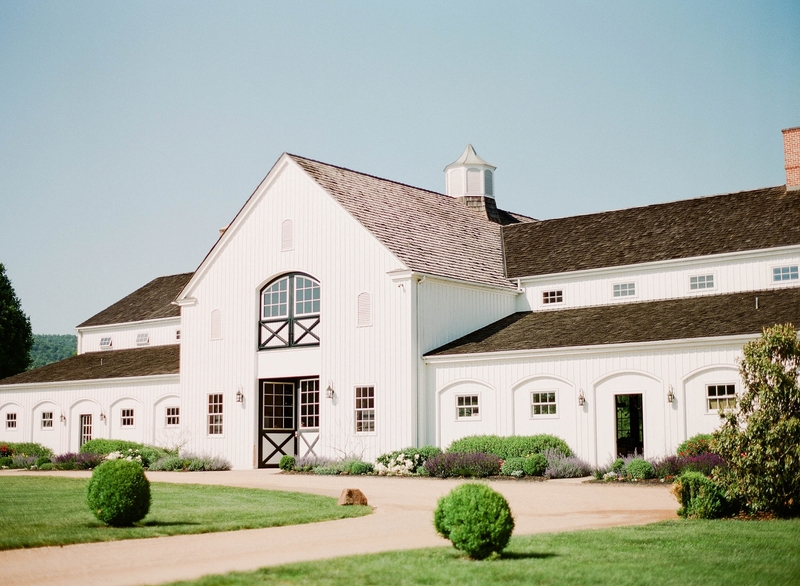 A 100-year-old dairy barn was moved in 2009 from the front of the property to its current location and converted into the family’s horse stable. What was once a stone applebarn is now a guesthouse. Nearby, a former double-sided corn crib c. 1860 has a new lease on life as a charming hunt cabin. The lakeside cottage was recently renovated and boasts incredible views of the lake and farm. Both are open for Historic Garden Week for the first time. Eleven fenced paddocks house the Wheeler’s horses and two Belgian mules along with a Clydesdale named “Bud.” The petting zoo is home to three goats, two donkeys and a pig. Two hundred brood cows graze across the 1,250-acre property. Listed on the National Register of Historic Places and the Virginia Landmarks Register. East Belmont is protected for future generations with a conservation easement held by the Virginia Outdoors Foundation. The Keswick Hunt Club will bring their hounds for a demonstration and Plein Air painters will be in the gardens (schedule available at Tour Headquarters). Ceil and Kenny Wheeler, owners. Originally known as the Middle or Belvoir Church, and later as Walker’s Church, this 1745 church was a square framed, wooden building that was plastered, white washed and ceiled inside under the rafters. Visible to the north side of the church are the old horse-mounting stones, which were used well into the early 1900s for those who came to church on horseback. In 1845 the vestry decided to build a new church. Stone was quarried from a nearby farm, Rougemont, but because of lack of funds, construction was not completed until 1855. In the late 1880s, roughly 11 acres of land was acquired through donations and purchases to establish the cemetery at Grace Episcopal Church. In 1895 the church burned, leaving only the bell tower and four walls standing. While the interior was completely destroyed, the 1,575-pound church bell survived and still rings each Sunday. The current stone structure was rebuilt in 1896. The first Blessing of the Hounds service took place on Thanksgiving in 1929 and continues annually to this day. 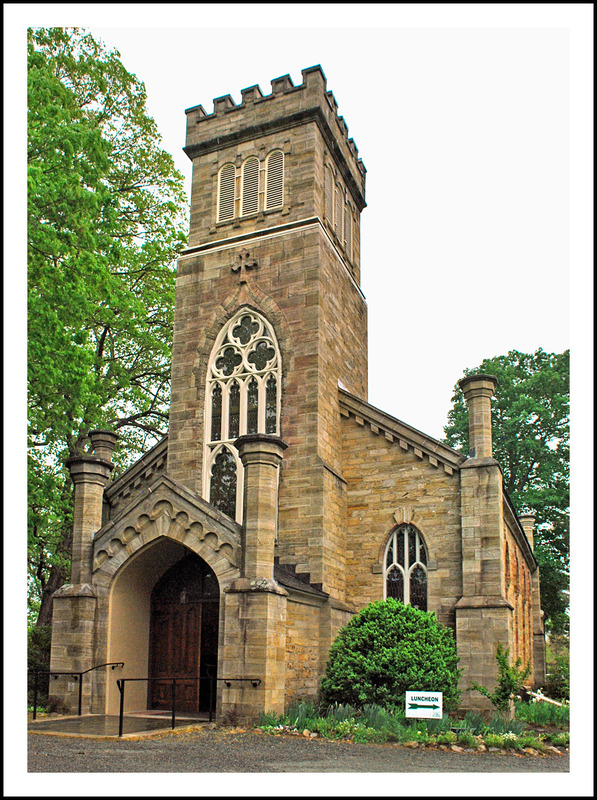 Grace Episcopal Church was the first church in the United States to institute this religious tradition, which originated in France in the 8th century, by St. Hubert, patron saint of hunters. Listed on the National Register of Historic Places. Docent-led tours of the church and grounds given throughout the day. Floral arrangements in the Sanctuary and Parish Hall, inspired by the church’s stained glass windows, created by the Keswick Garden Club. Tour Headquarters + Marketplace: Castle Hill Cider, 6065 Turkey Sag Rd. Keswick, VA 22947. Tickets on tour day available only at Tour Headquarters. The cidery is built on land that was once part of the Castle Hill estate. Shop local vendors at the Tour’s Marketplace and enjoy talks by experts on Keswick history, architecture and horticulture. Maps and directions to all properties available, as well as schedules of special events and demonstrations at the properties. A large scale outdoor Ikebana installation will also be on exhibit. Directions to Tour Headquarters: From I-64 take the Shadwell Exit 124. Go East on Richmond Rd./Rt. 250 for 2 mi. Turn left onto Louisa Rd./VA22 East. Proceed 8.5 mi. to Turkey Sag Rd. Turn left and continue for 0.3 mi. Cidery on left. Parking and Shuttle: This is a driving tour. Onsite parking available at all properties except Castle Hill, which is accessible via shuttle service from Tour Headquarters only. Shuttles available from 10 a.m. to 5 p.m.; last shuttle will depart from headquarters at 4 p.m. Groups in vehicles larger than 10 passenger vans need to notify Linda MacIlwaine at macilwaine@comcast.net. Properties may be visited in any order, although Ben-Coolyn must be accessed through East Belmont. Facilities: Portable restrooms are available at each property. $18 each. 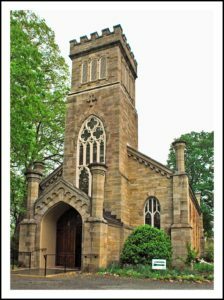 Box lunches prepared by Hot Cakes available by prepaid advance reservation at Grace Episcopal Church from 11:30 a.m. to 2:30 p.m. on Sunday, April 22, only. Checks for $18 per person payable to “Grace Episcopal Church,” Attn: HGW Luncheon, P. O. Box 63, Keswick, VA 22947. Pay by credit card online via PayPal. 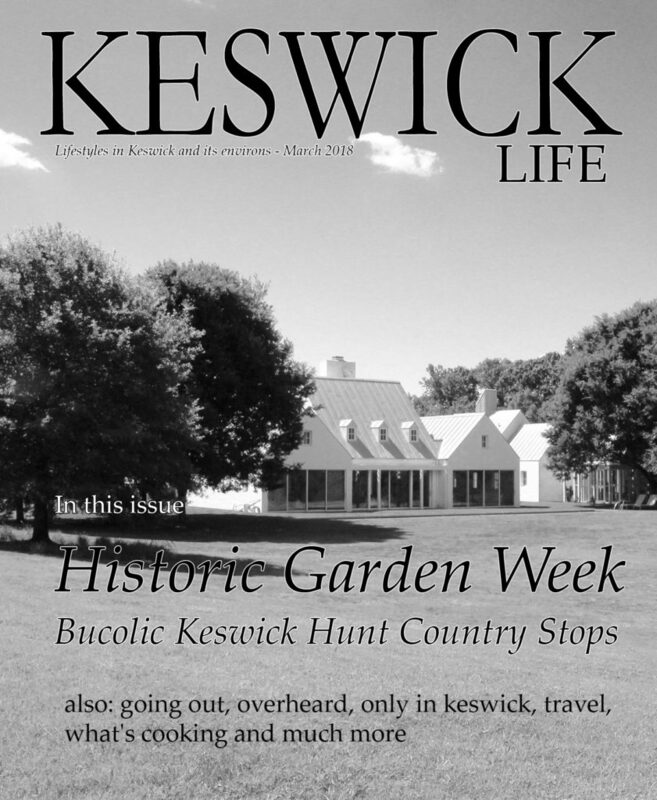 Go to www.grace keswick.org and click on box for Historic Garden Week. Payment must be received by Friday, April 13. Confirmations will not be mailed and luncheon reservations are non-refundable. Grace Episcopal Church is located at 5607 Gordonsville Road/VA-231, Keswick, VA 22947. Complimentary and served throughout the day beside the pool at East Belmont. This tour is not handicapped accessible. Cell phone and GPS service may be unreliable at certain locations on the tour. 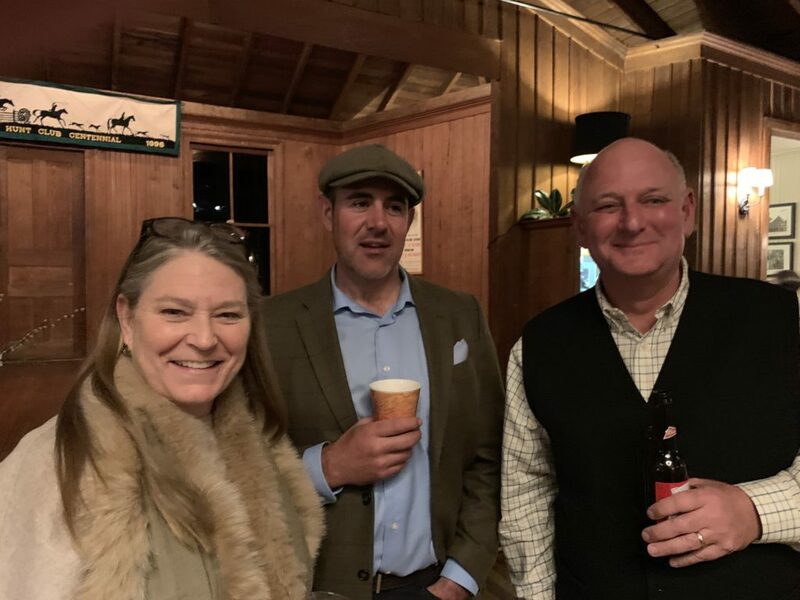 A number of members concerned about the condition of the Hunt Club have stepped forward with a plan and initial funding for a major renovation of the club. 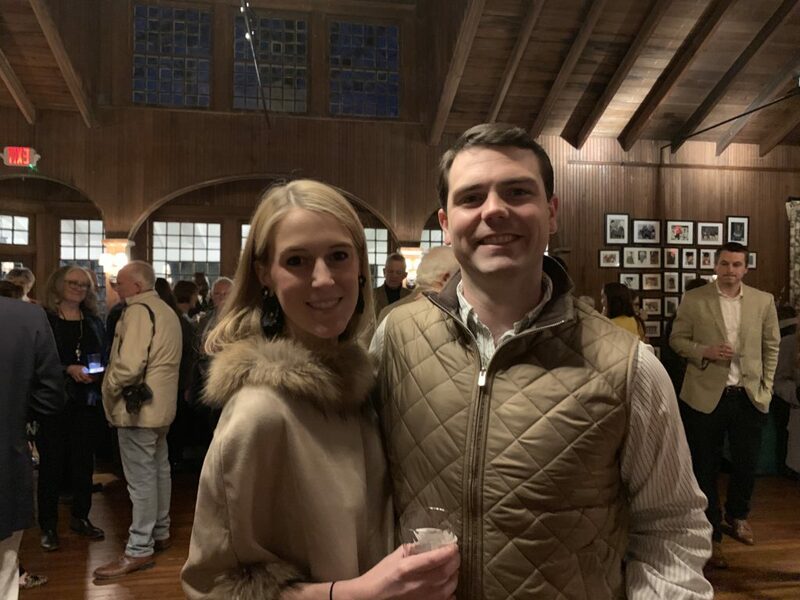 In a presentation to the members on February 6, they presented preliminary plans including renovation to the kitchen, bathrooms, HVAC, a teardown of the Huntsman’s cottage and building a new one along with a new barn. Moving the structures opens up space for parking on the property as well as protecting the existing trees. The Board stressed that a major consideration of the renovation was to retain the historic character of the club so any additions will be add-ons not changes to the interior. The physical condition of the club necessitates a full-scale renovation. The kitchen is in terrible shape and the electrical system is sketchy to say the least. The bathrooms are not handicap-accessible and those deficiencies alone not only make the club unsafe and also limit its potential for rental income. 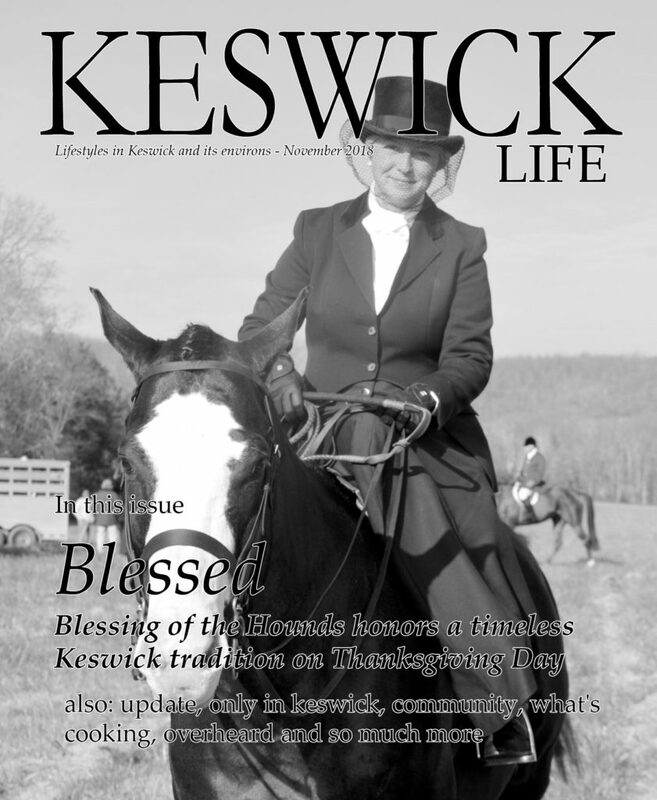 Instead of financing the renovation by raising dues, the Board is beginning a campaign to raise the funds from the membership and interested members of the Keswick and equine community. Indications are that a portion of the estimated 2.5 million dollar cost has been pledged. While a construction schedule and finished plans are in the works, the Board intends to begin construction as soon as possible. Hopefully in the near future, the club will be good to go for another hundred years. 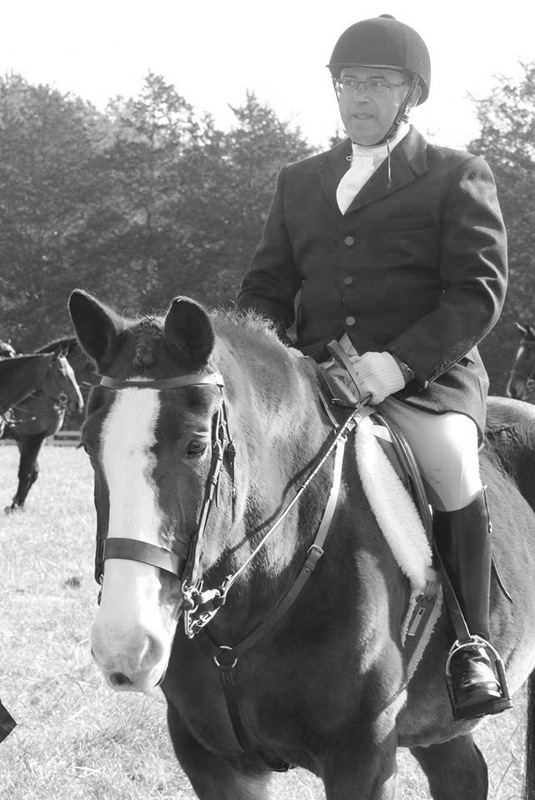 he Keswick Hunt Club was established in 1896. In 1898 the clubhouse was built under the direction of Horatio MacGruder. The building has been used continuously as a club house for social events related to fox hunting. The veranda, constructed prior to 1925, surrounds three s ides of the rectangular structure and since the time of construction, has been partially enclosed. The building is in the late Victorian style, with a side gable and an Edwardian bay window. 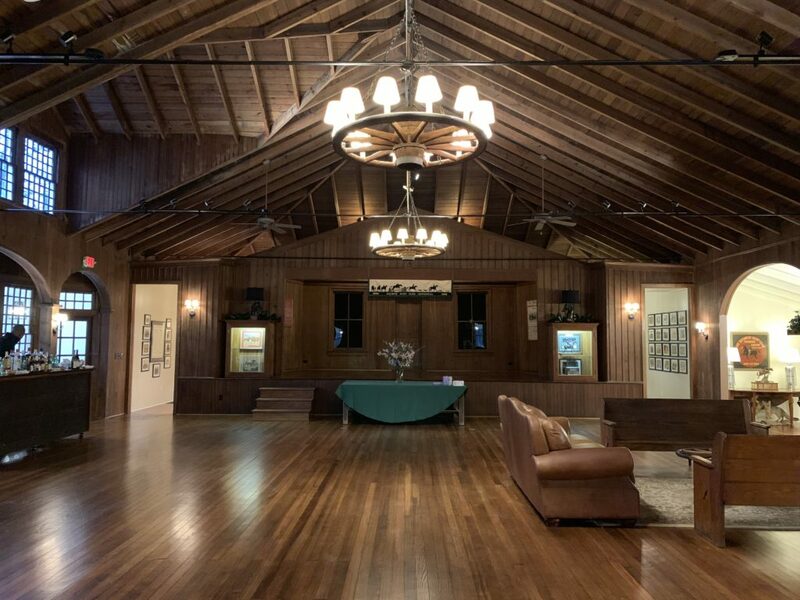 A detailed description of the building itself included: “The building is ceiled with the best North Carolina pine; has a floor of excellent smoothness, and is plentifully supplied with doors and windows to admit the cool mountain breeze. The situation of the club-house is almost ideal. To the north and west one catches a magnificent view of the southwest mountains, a brotherhood long since made famous by historic old ‘Monticello.’ A country highway passes near the building, a telephone line runs by the door, and the post office and telegraph office at Keswick are scarcely half a mile distant. The article went on to describe the party that followed the dedication ceremony: “The audience hall was artistically decorated with sweeping draperies of white and red, while flags and unique club devices were gracefully disposed here and there. The music was furnished by an excellent band from Washington, and the entertainment in every detail was a most pleasing and decided success. Refreshments were served during the evening and it was not till half-past 3 a.m. that the bright hours of gayety were brought to an end. 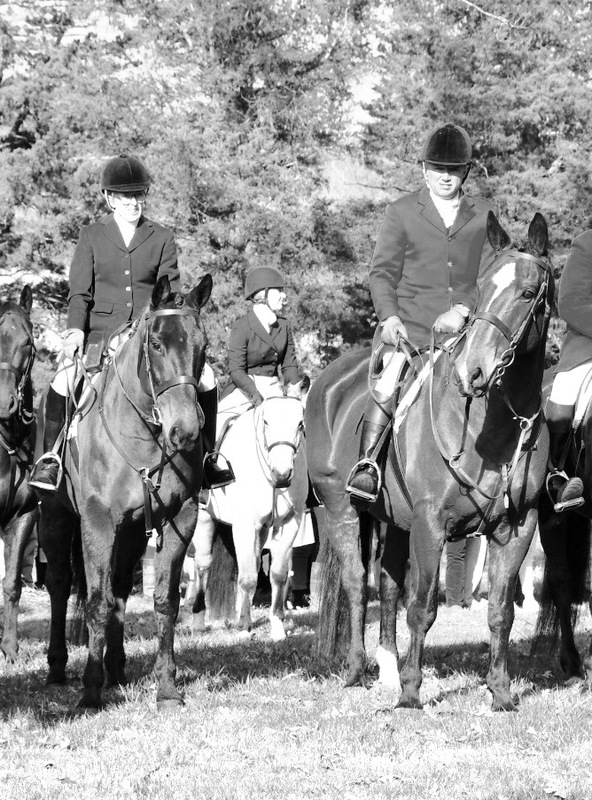 The Keswick Hunt Club continues to operate to this day and, in addition to continuing the tradition of the fox hunt, the club has continuously sponsored the Keswick Horse Show since its inception in 1904 and has supported several local nonprofits.